A little late in posting but getting this done before the following month is over so technically I am still okay, right? 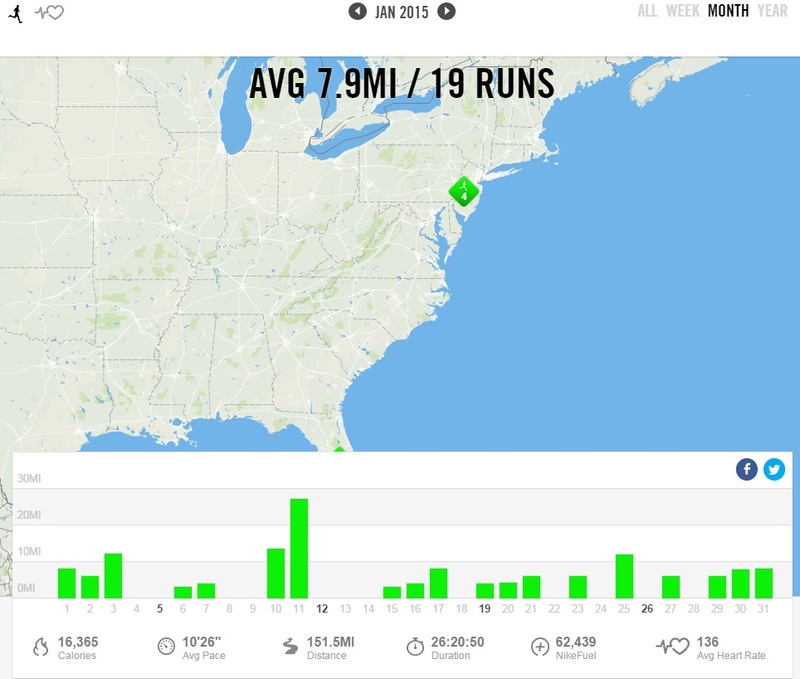 My training shows I ran just over 150 miles for January. 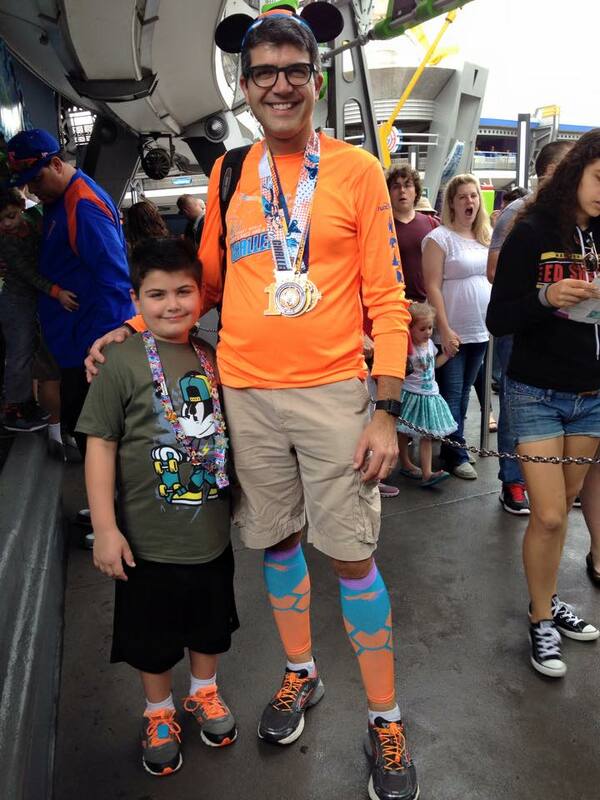 This included running 39.3 miles as part of the 2015 Goofy Challenge. You can read my recaps for the Expo, Half and Full by clicking on the links. It was a fun weekend and one that my wife and I had been training for and that we also made time for a family trip which made the experience much more enjoyable. I certainly made the most of this as there were a couple of milestones for me. 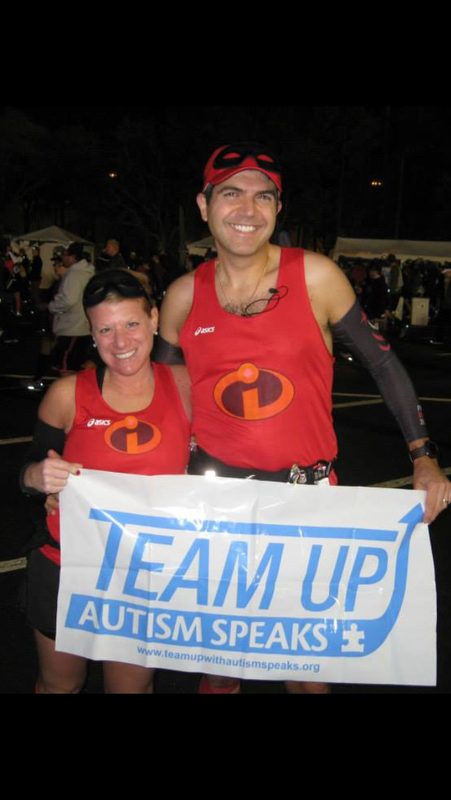 It was my third year running for Team Up with Autism Speaks and it brought my fund raising total over $11,000 for this cause. 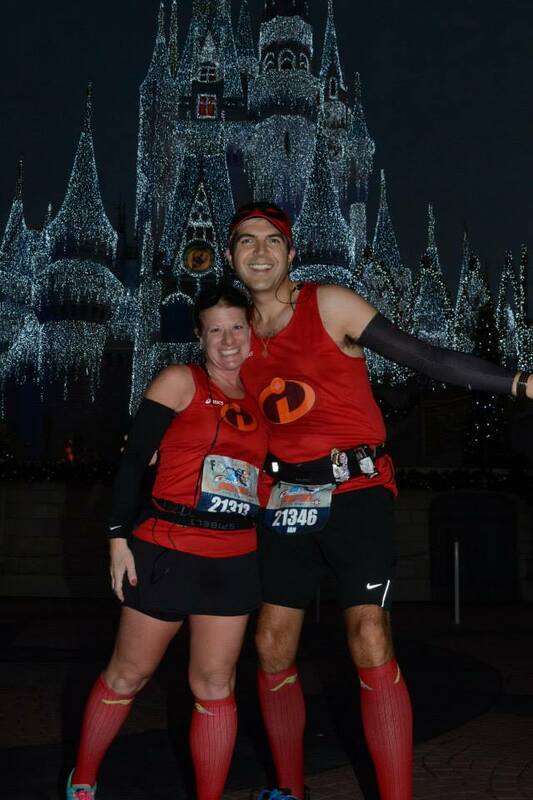 Also, this might be our last runDisney race for a while. Logisitics wise it is hard with both boys in school to take the time to do this. Also, I think I need to give my generous donors a small break from fundraising. Finally, I’m hoping to find a way to do one of the Disneyland races and that will take a while to build up some funds as I want to take the whole family to the West Coast. With the temperatures being what they are here I’ve had very little opportunity to run outside and so I’ve been taking some time to catch up on my podcast backlog while running many miles on the treadmill. Not that I mind too much as it gives me the chance to wear my INKnBURN shirts during the winter months. Hey, I like to look good when I run (it distracts from the facial expressions that I probably make). 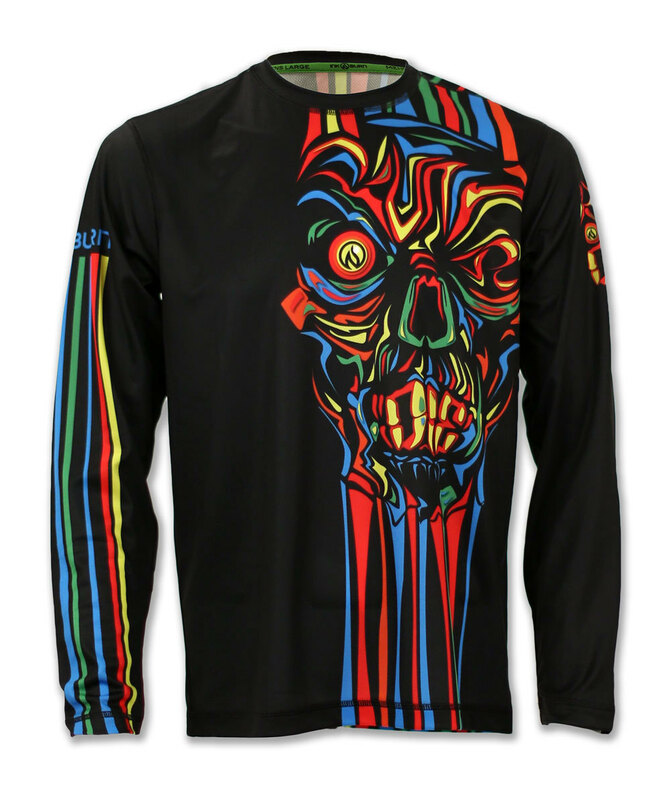 Here’s my new shirt from their new 2015 catalogue. 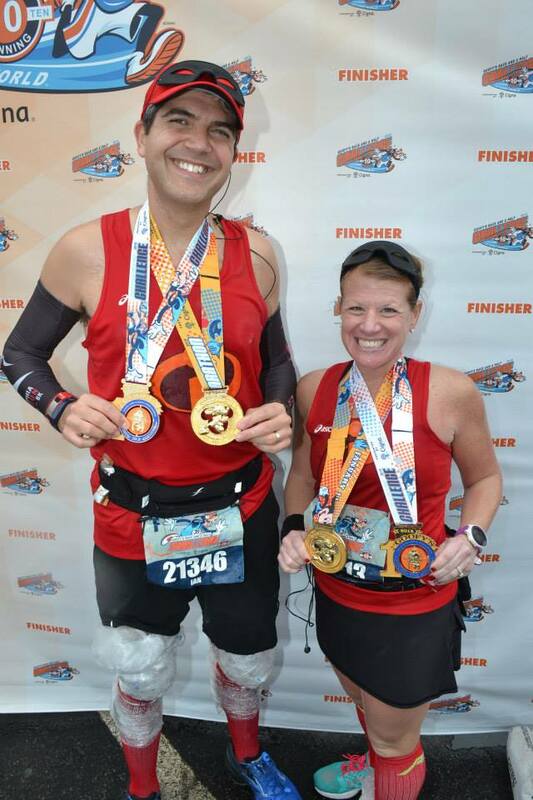 So, after completing the Goofy Challenge my wife and I are straight into our Pittsburgh Marathon training. 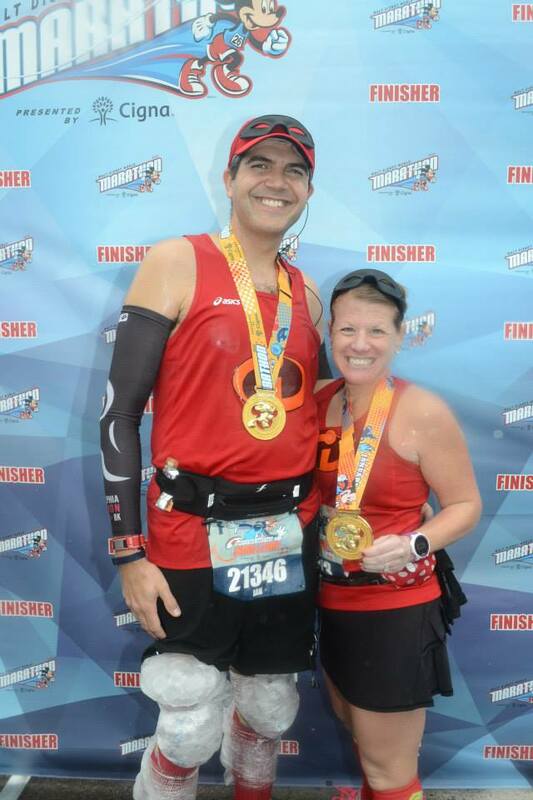 I’m also looking for some potential other long races (yes, let’s say marathon distances) in addition to waiting for the Marine Corps Marathon lottery to open in March. We shall see. It’s been a good start to the year. So today was the big day. The full marathon. 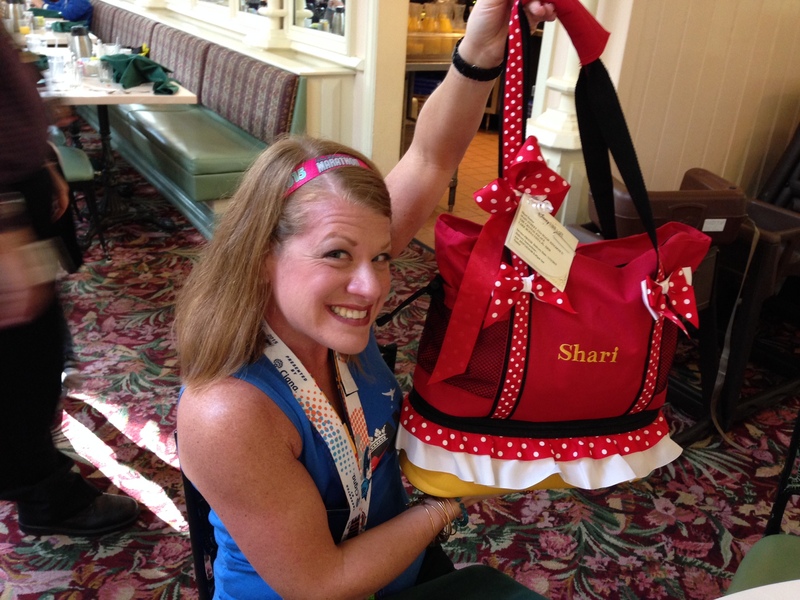 Also Shari’s second day of the Goofy Challenge. I think she was a little nervous but she seemed to be pretty upbeat. Me? Well I was excited. This is the day I have been waiting for. 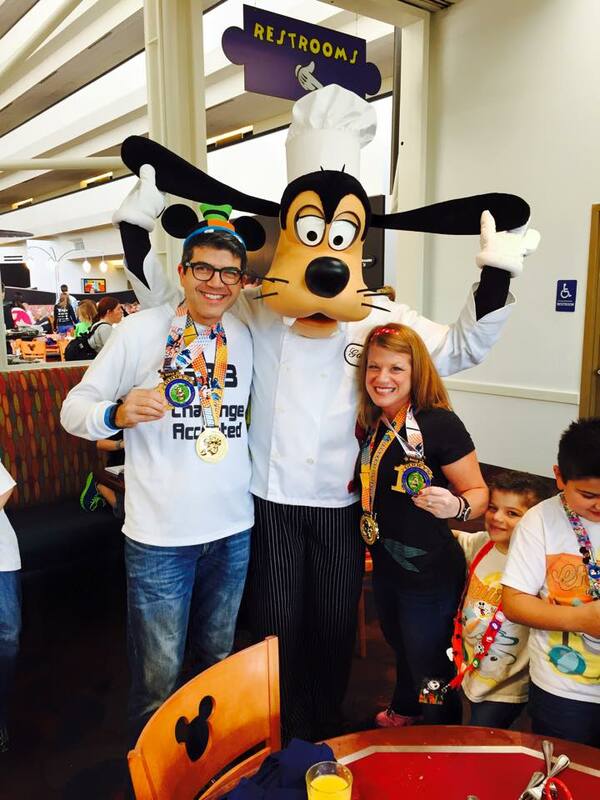 The first time I ran Goofy was back in 2013 and I was a little nervous but as it was Shari’s first full marathon I was focusing on her then and less of me. I did struggle but I finished. 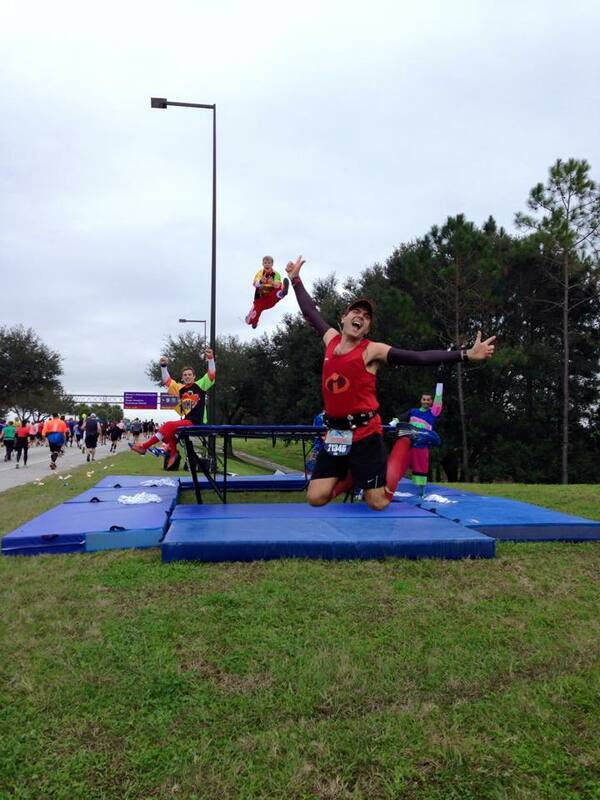 Last year when I ran the Dopey Challenge I had a blast. I felt great and had so much fun. Today would be a little different but fun all the same. Having the kids with us was much more tiring than running Dopey!!! The whole point of today was to celebrate our running and our fundraising. 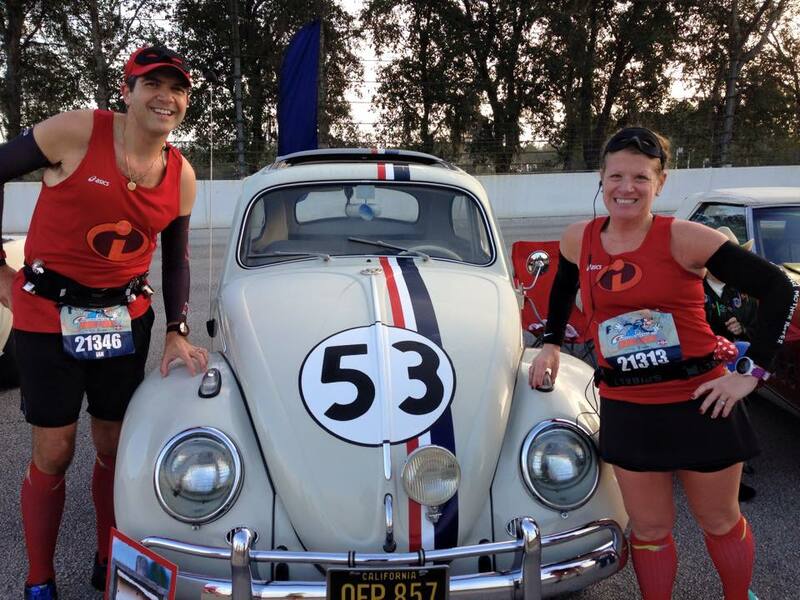 Oh, and to run a little race dressed in costume (which had been decided upon months ago). So again with the multiple alarms I was up at 2am. No baby sitter today. We had an adjoining suite with my brother-in-law and sister-in-law and we had left the doors open and the kids knew to look for them when they woke up. Shari was up around 2.30am and we were dressed and ready to leave around 3am. It was time for the big costume reveal. We arrived at EPCOT around 3:30am. Although it was warmer this morning than the previous few days Shari wanted to stay in the car a bit longer and this meant we sat there a while as she watched me squirm with nervous energy, itching to get out and mingle at the race meet up. Eventually I won and we headed into the staging areas. On the way in we stopped by the Team Up Autism Speaks tent and said hello to Phillip who was waiting to meet and great the folks walking through the charity village on the way into the staging areas. As we were talking to Phillip we met Sarah (Sparkly Runner), her boyfriend Matthew and her Dad (running his first marathon). It was great to catch up with them (multiple times that weekend too) and we chatted together as we headed in. 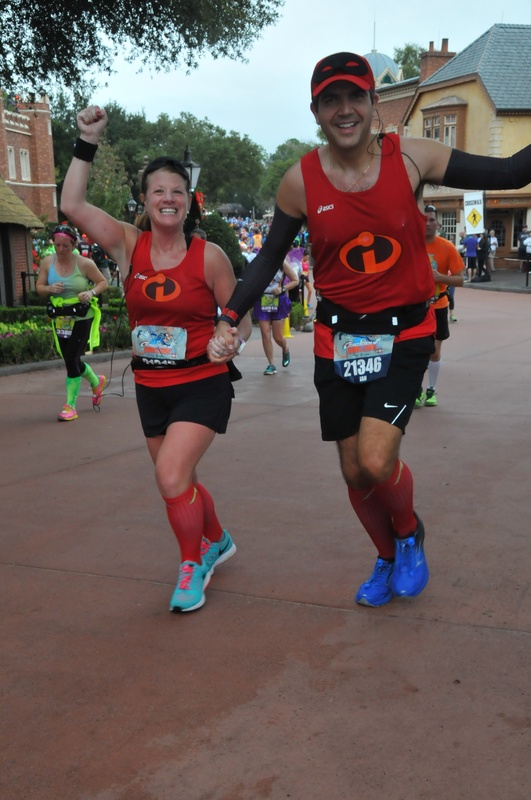 As I said in my previous post, the camaraderie and friendship at runDisney races is amazing and also helps you relax pre race. 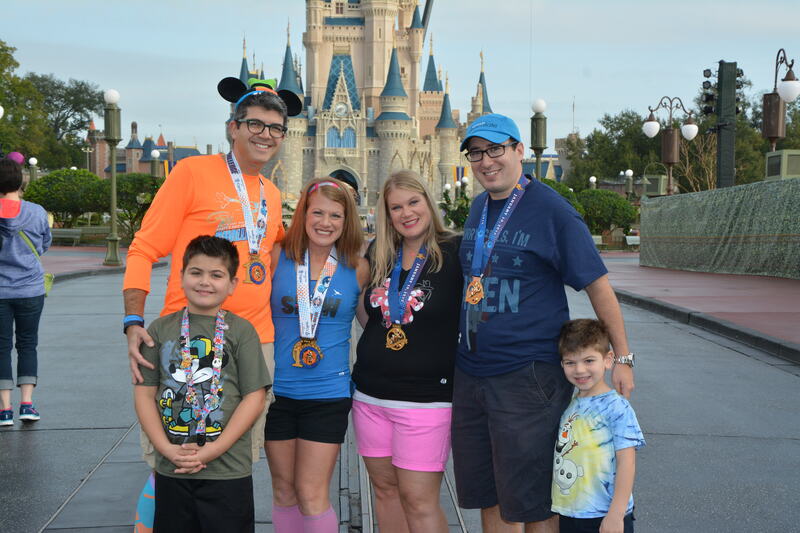 Although we were not there in time for the group photograph this morning we were still able to meet up with and hang out with the Mickey Milers again. It was warmer this morning but we still needed something to cover us up until the start. Shari was proudly showing off her trash bag look again and I wore my throw away jacket that this morning decided to not zip up. Good choice for a throw away item. After wishing our friends good luck we headed off to bag check (we remembered who was checking the bag today!) and the long walk to the corrals. Today’s walk to the corrals seemed a little less crowded. Again, I believe it may be because the full marathon field is just that bit smaller that it doesn’t seem so cramped. Although it is still cramped. It is dark as you walk along despite the overhead spotlights. As we are all bunched together that throws a lot of shadow on the ground. We saw a few people slip and fall on the side of the walking path. One of the worst was when we saw a man fall and because he was wearing a trash bag he couldn’t put his arms out to stop himself. Thankfully we saw him get up and he seemed okay but he had fallen on his side and burst all his energy gels and was a mess. 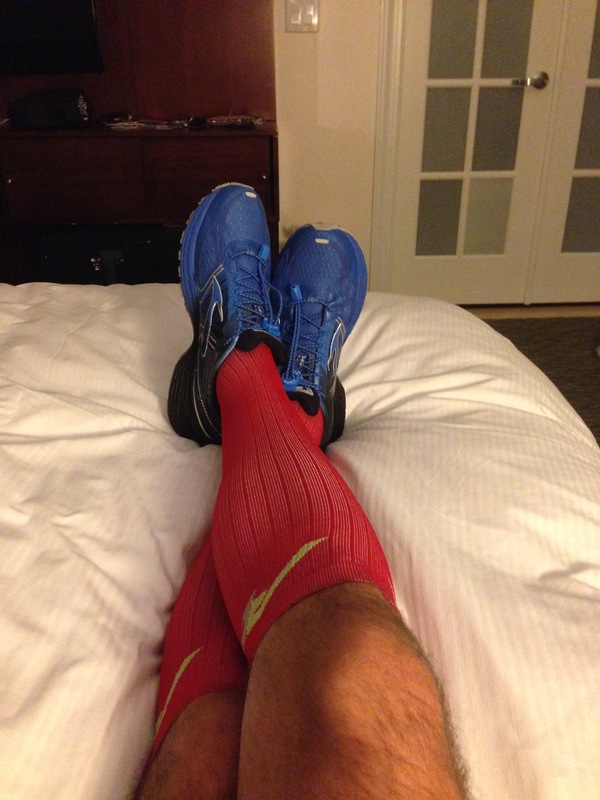 That is not the way you want to feel at 5:00am in the morning and just about to start a marathon. I hope he did okay. We got to the corrals just as the interviews with the runners were ending and just before the singing of the National Anthem. We were then ready to go. We were in Corral F again so we watched the big screen as the wheelchair racers went off and then the elites. We slowly moved forward until it was our turn to go. 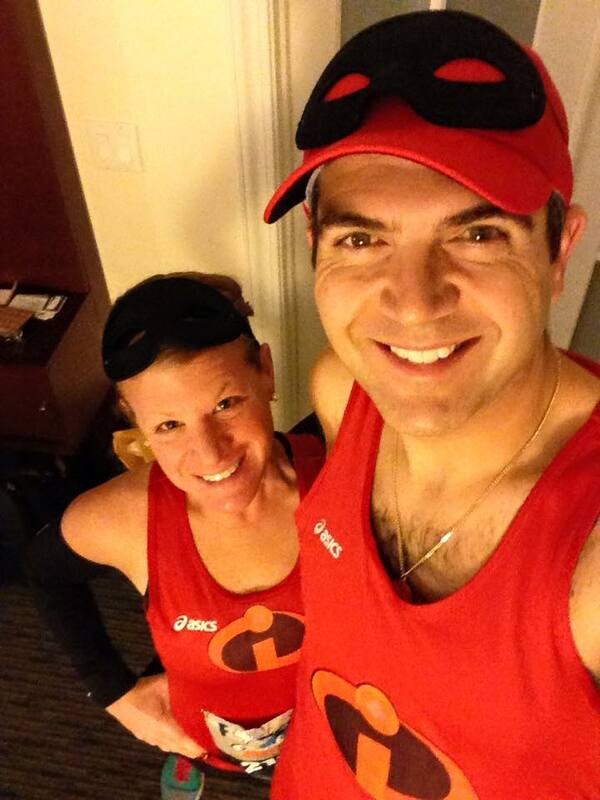 Today we were not in our Team Up charity gear but Mr and Mrs Incredible were sure excited to go. And before you know it we were off! The marathon takes the same route as the half marathon until just after mile 7 and the character stops are pretty much the same both days. We decided that today would be the day to stop at the characters we missed the day before. 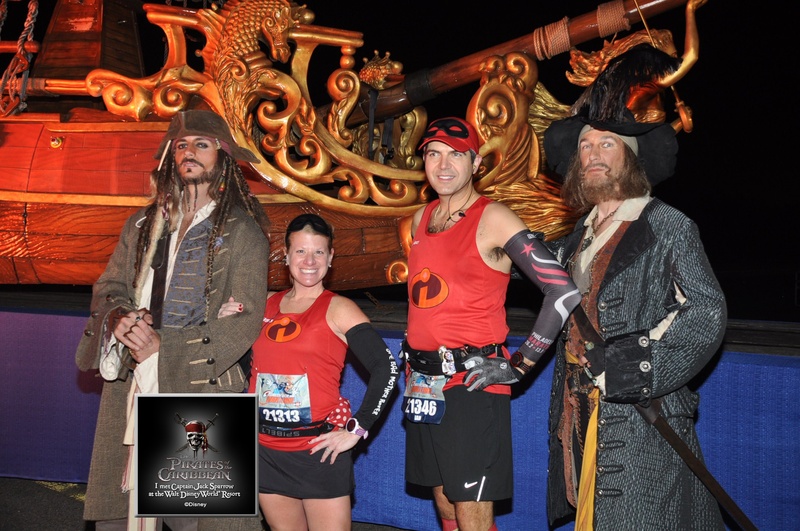 Our first stop was just before mile 2 as we reached the ‘Pirates of the Caribbean’ set with Captain’s Jack Sparrow and Barbosa. As it was warmer, Shari had ditched her trash bag and I’d said goodbye to my old jacket. 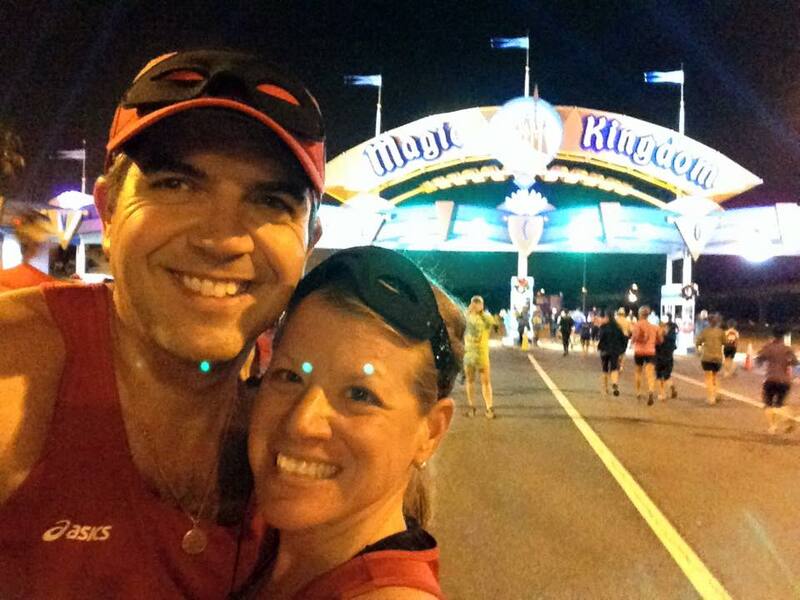 We made our way from there through the turnstiles and on towards the Magic Kingdom. As we approached the Ticket and Transportation Center (TTC) today it was better lit and we were able to get our picture of Wreck-it Ralph and Venelope Von Schweetz that didn’t quite come out yesterday. Probably because the Walt Disney World Speedway was being used today and is beside the parking lot that provided better lighting. 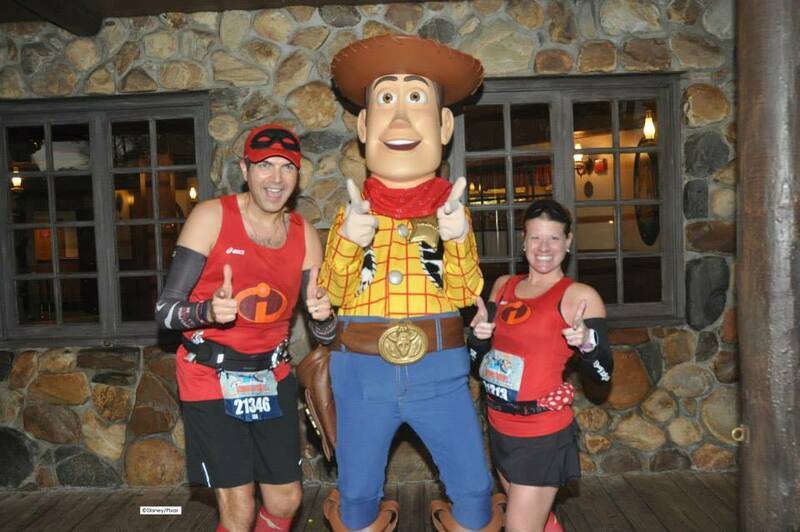 It was there that we bumped into another Goofy runner who we seemed to meet at every photo stop for the rest of the day (and were on a table near him the next day at breakfast!) 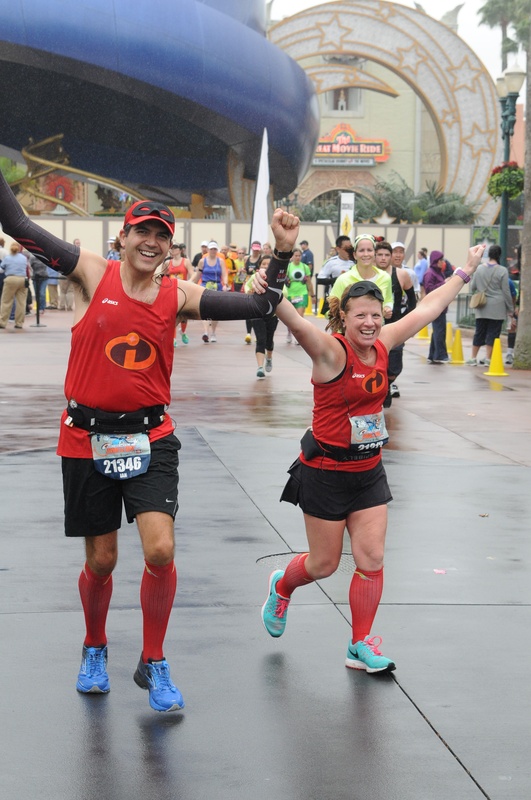 One of my favorite things about running these events is seeing faces throughout the parks all weekend long who you have run alongside during the races. Always good to say hello and congratulations after the races. As we reached the TTC we took the opportunity for another bathroom stop. 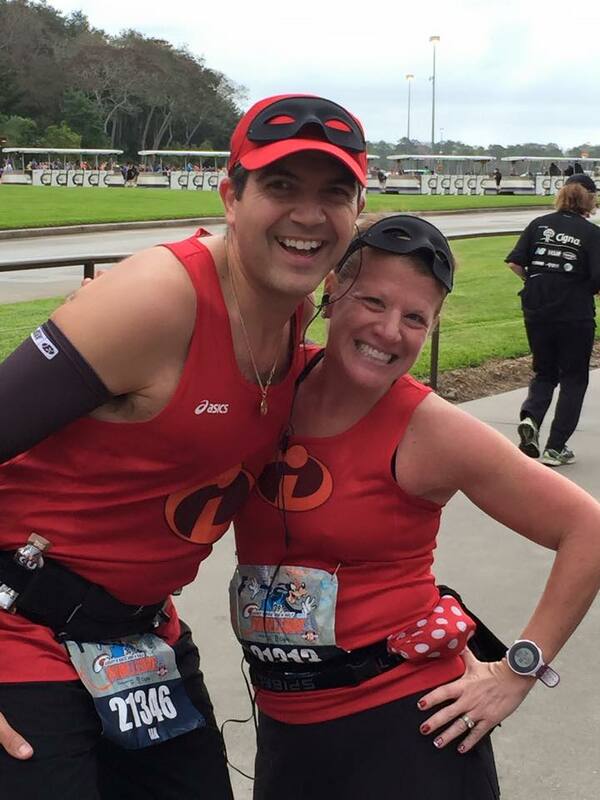 While waiting outside the bathroom for Shari I saw and cheered a few Mickey Milers and also saw another couple dressed as Mr and Mrs Incredible (oh yeah…the challenge was on now whether they realized it or not). From there we headed towards the Contemporary Resort and through the tunnel under Bay Lake. 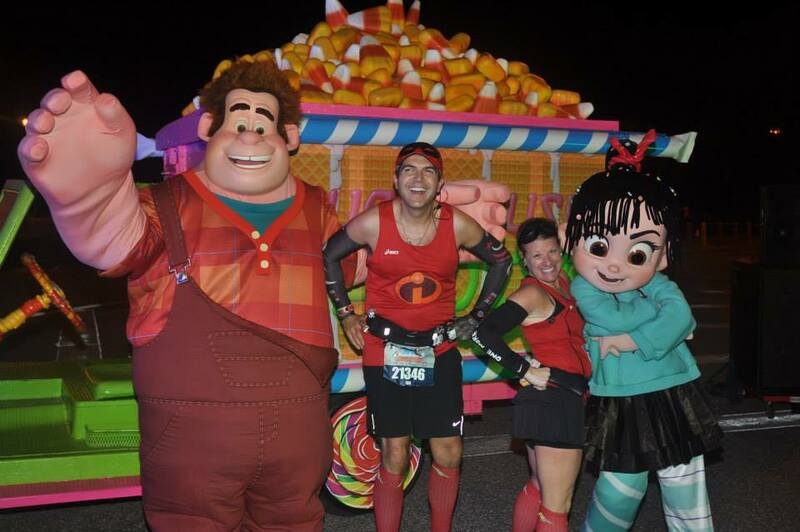 As we were running we bumped into our friends and fellow Mickey Milers Eddie, Phill and Joe. Eddie was running with his Go Pro so we made it onto his video. 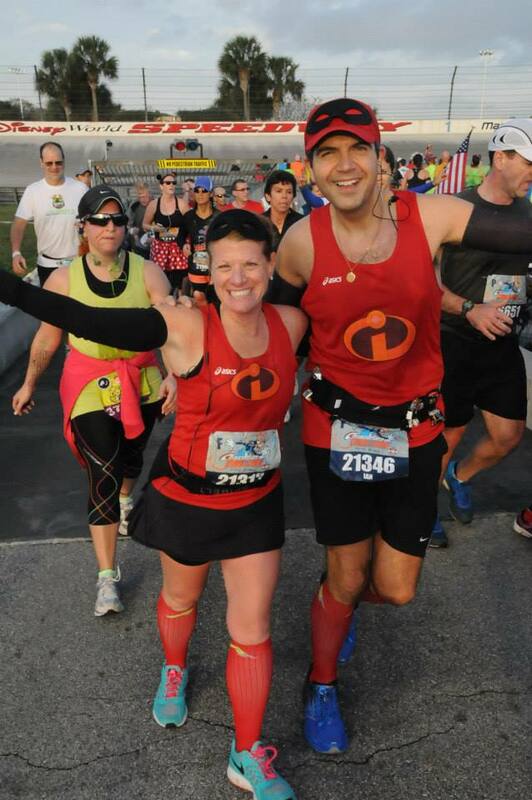 From there we ran around the back of Space Mountain (mile 5) and looped into the back stage area before making it out onto Main Street USA (my favorite part of the race). As we reached the hub on Main Street and were about to turn right into Tomorrowland we saw Sarah again who was there to cheer on her Dad and Matthew. As we circled into Tomorrowland it was the first time that I noticed that the neon lights were the same colors that appear on Buzz Lightyear. Strange what goes through your mind and I’d never noticed that before. I guess the lighting was just right. Anyway, today we stopped for Buzz as the line wasn’t too long today. From Tomorrowland we ran past the Tomorrowland Speedway and into Fantasyland where today we stopped to have our picture taken with the White Rabbit from Alice in Wonderland. As we continued through Fantasyland there was the same character from Tangled that we had seen the previous day. Again…we didn’t stop but continued through to the castle past Prince Charming’s Regal Carousel. 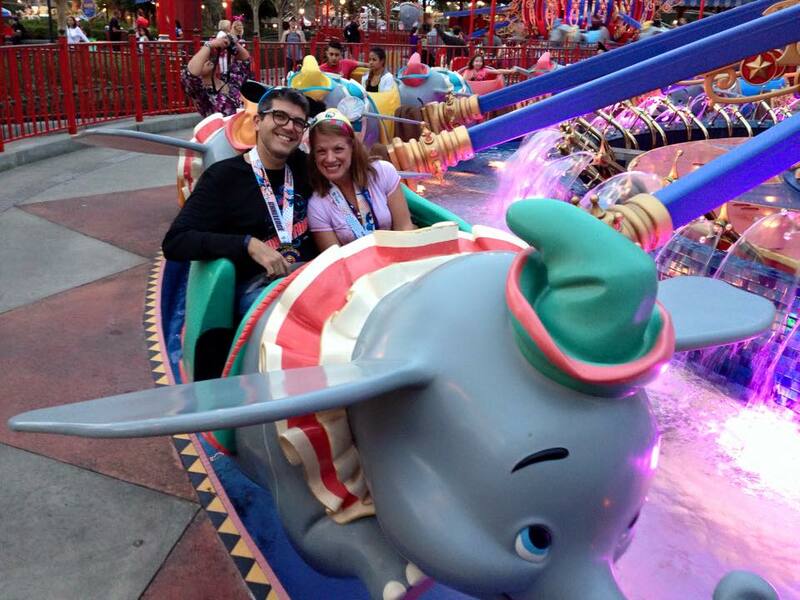 As we approached the carousel there were cast members handing out tissues to runners. It was a nice little touch…plenty of waste baskets too. 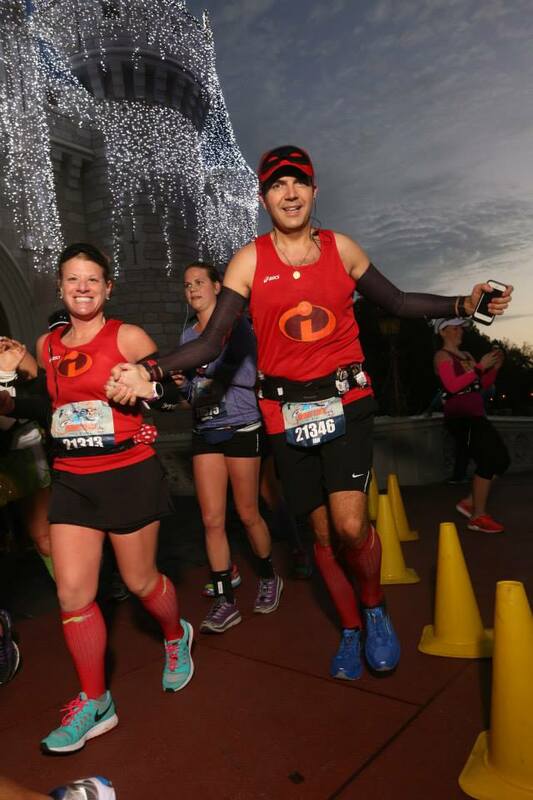 As was the case during the half marathon yesterday, because of the repairs to Cinderella’s Royal Table there was no appearance by Mickey and Minnie in front of the castle which was a shame. That is a great photo to have. I’m so thankful that I took the time to wait in line last year for that photo. 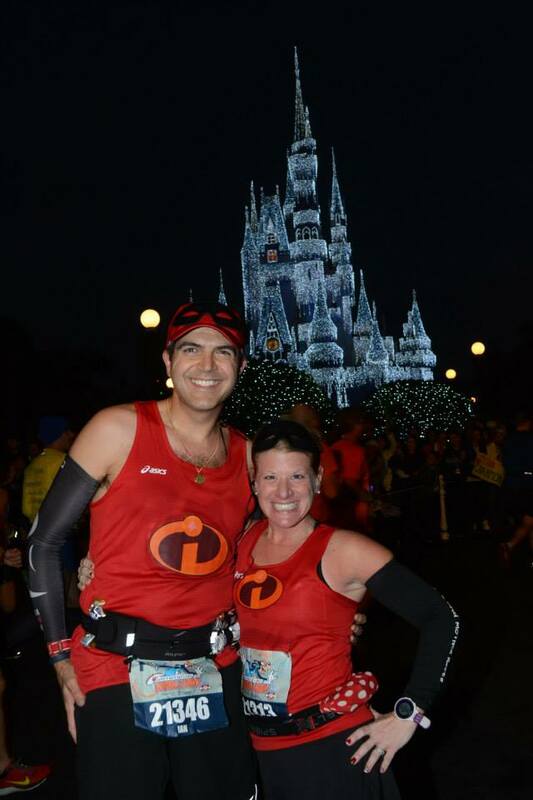 We got some great professional photos as we ran through and in front of the castle. So on towards Frontierland and out towards the backstage areas and out of the park. 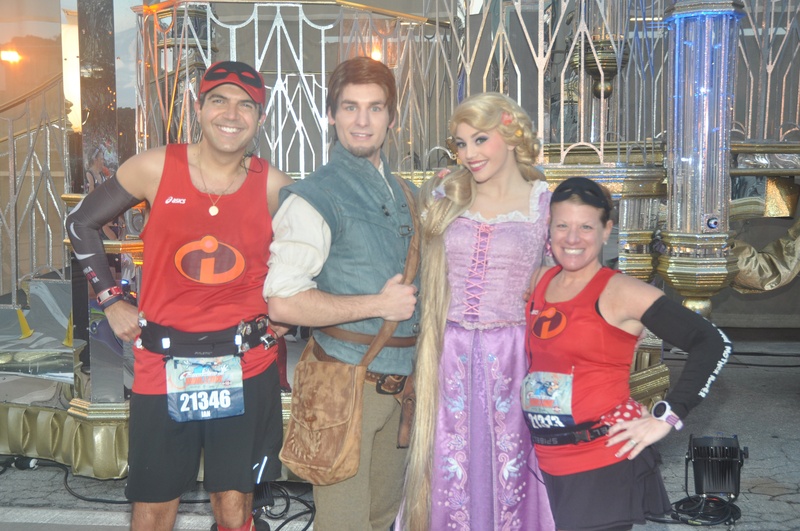 We got an awesome photo with Woody (first time I think I’ve had a race photo with him) and also stopped for a quick photo with Rapunzel and Flynn Rider (although we had to wait for a group of runners who wanted at least 5 different pose variations each with their own cell phone cameras…ugh). ….and out of the park into ‘Cone Alley’. As we made our way along this narrow stretch I heard the funniest line from the DJ. He said ‘You’re all at about 2 hours into the race. No-one has crossed the finish line yet so you are all still in with a chance!” Funny. Runners humor I guess. 2 hours, wow, we really had spent a lot of time taking photos. 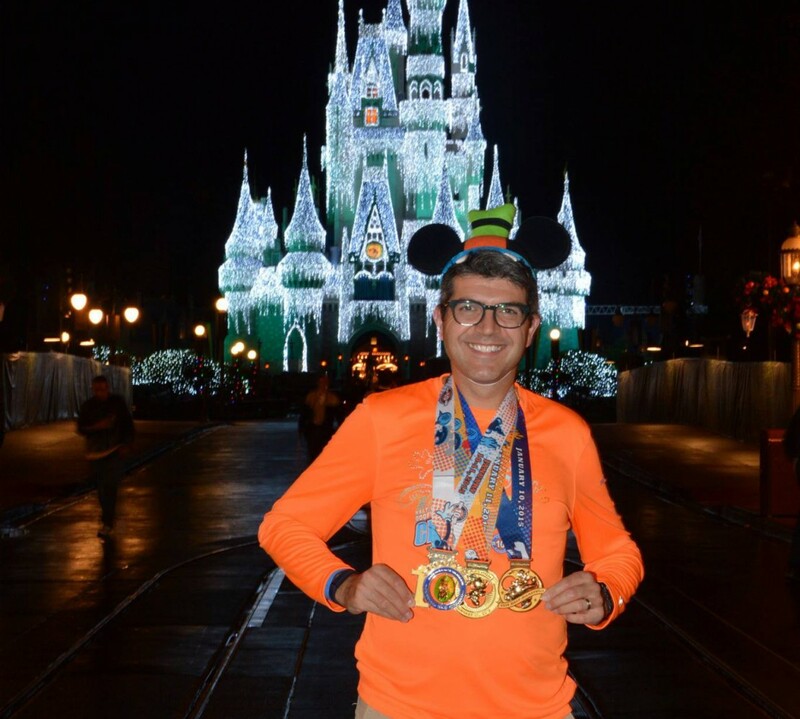 I think at one point our lap times showed that we ran an 18 minute mile through the Magic Kingdom thanks to all the photo opportunities. Oh well, there would be plenty of open road on the second half of the course to make up any time. Believe me…plenty of open road!!! 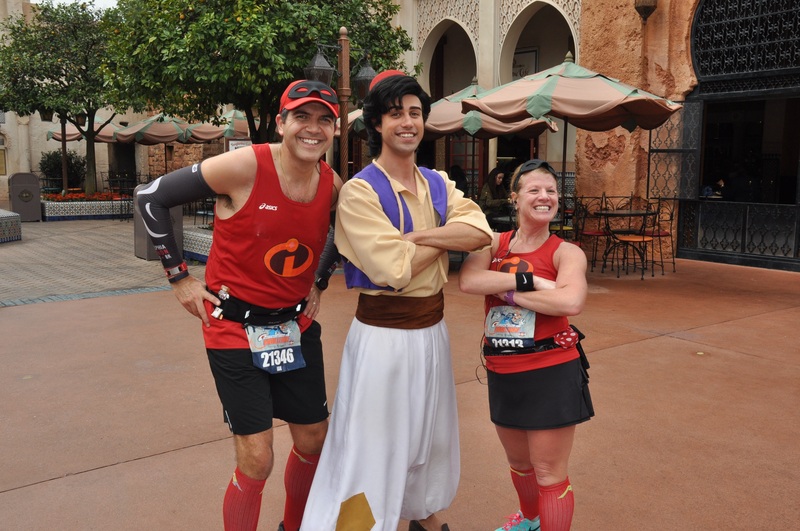 We skipped a stop with the Genie from Aladdin today as we had stopped yesterday and this is the point where the half and the full marathons change course. 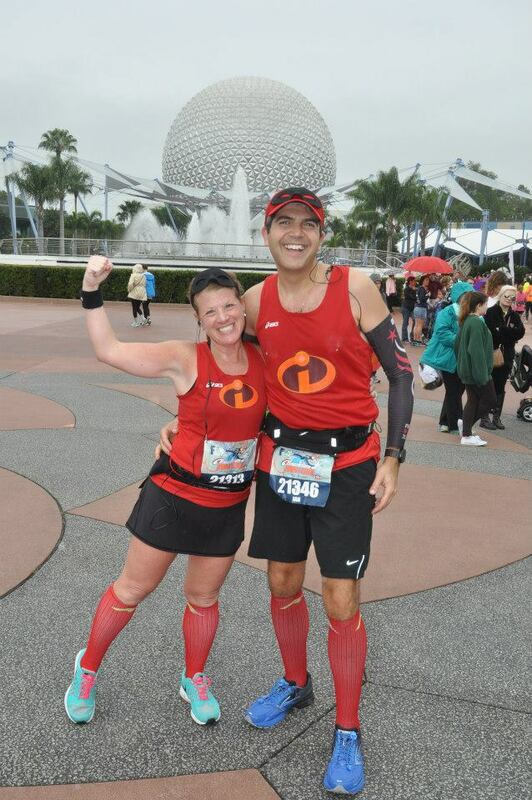 In the half marathon you start to make your way from here back towards EPCOT. 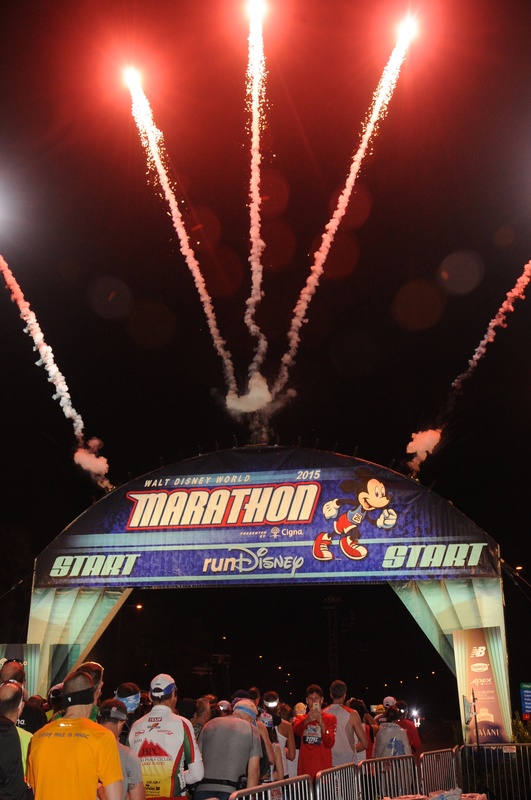 For the marathon you make a turn onto the Walt Disney World Speedway. As you approach the track you run alongside some exotic cars as you head into the tunnel. The tunnel has the steepest downhill and uphill of the course before making it out onto the track for a lap (which is about a mile). The track is flat on the inside lower level and is banked up on the outside. Classic cars and other car clubs had set up their cars on the bank of the track and we stopped to take a quick picture with Herbie. Once you exit the Speedway you make a small trek across a grassy strip and head out towards the Animal Kingdom. I took a quick stop at the med tent for a little vaseline as the shirt I was wearing was irritating me just a little (never wore this before race day…). Thankfully I wasn’t bothered by the shirt for the rest of the race. We were only at mile 8 at this point. As you approach the Animal Kingdom you run past the water treatment plant. Luckily it was not such a warm day although you could still pick up that ‘delightful’ smell as you ran past. They do good job at trying to entertain you as you run along this part of the race. They have signs along the left side of the road with interesting facts about Donald Duck. Also they had a great photo opportunity along the right side of the road which involved our longest wait in line of the race. As you can see below it was well worth the wait. 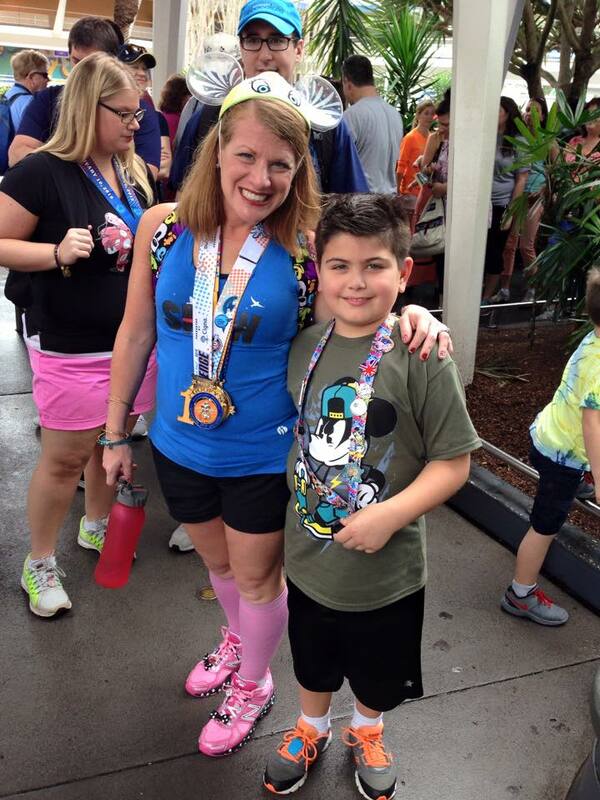 As we moved away from the villains (having chatted in line with our runner friend from earlier in the day) we literally bumped into another Mickey Miler (Tammy) who was running her very first marathon. Earlier this year Tammy had volunteered at the ‘Chasing the Unicorn‘ marathon which I had run and it was great to see her again and cheer her on for her first marathon. 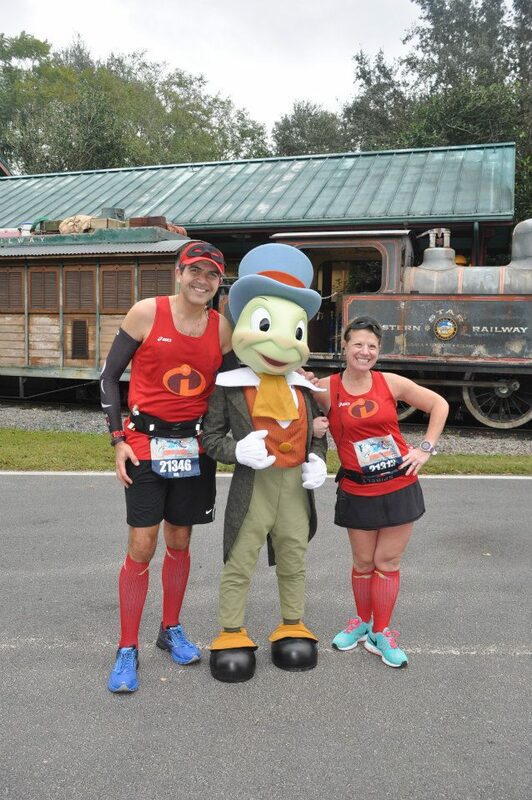 We ran alongside her for a little while as we approached the Animal Kingdom until Shari and I split off to take a photo with Jiminy Cricket. As we got closer to the Animal Kingdom we saw but did not stop at some of the less seen characters. They had Robin Hood, Little John and Friar Tuck out for a photo opportunity. The line was really long as these are not seen very often these days so we decided to move along. 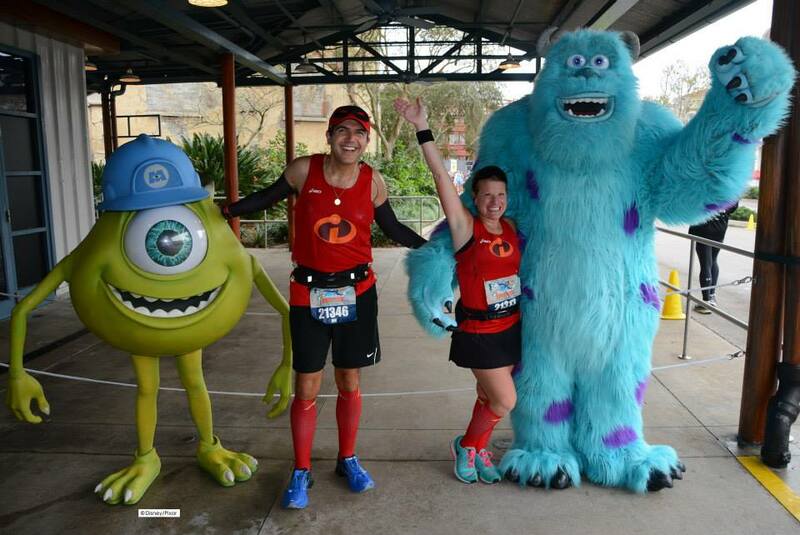 As we were running we started to see some of the Animal Kingdom parade decorations which started a small group of runners singing ‘Circle of Life’ in which we all joined in. Hey, this is a Disney Marathon and we get entertained any way we can. 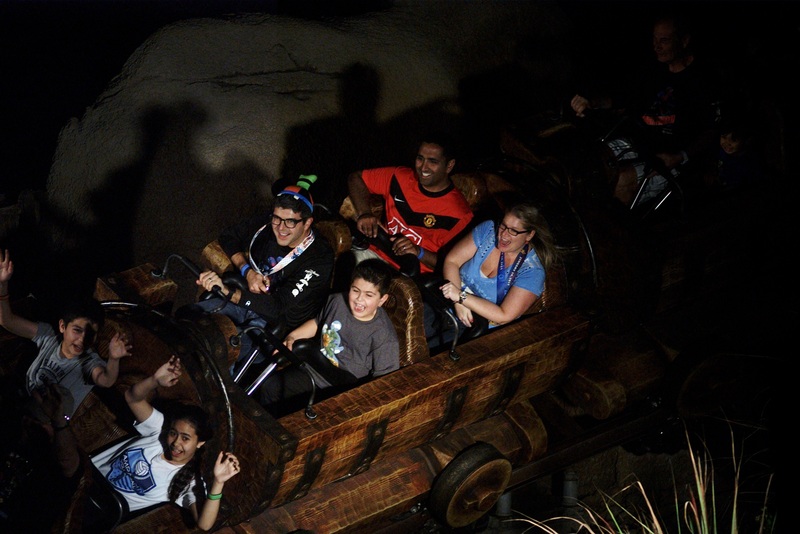 As we entered into the Animal Kingdom we ran alongside the cast members who were outside with various animals. We decided not to stop for photos as we probably smelled worse than the animals. We had discussed the possibility of riding Expedition Everest if it was open and looking at our watches we knew we would probably be hitting the park just as it was opening. I wasn’t really looking forward to doing this as I’m not a coaster rider BUT I had promised Shari I would try. As we entered the park we saw a long line of folks at the entrance to the ride. As we approached the cast member said that the ride wasn’t yet open and there was a 30 minute wait from the point we were arriving at. Disappointing and I didn’t really feel like standing around for 30 minutes on these legs when we still hadn’t reached the half way point of the race. There was a little disappointment in Shari’s face (although I think she resented the fact that I looked relieved). So we headed on and ran through the park stopping along the way for a quick photo opportunity with Minnie and Daisy. Everyone we spoke with after agreed that if there wasn’t a line then it would have been a definite stop for Everest but 30 minutes…not happening. The exit to the park is just about half way. There is a water stop here before we head out towards the parking lot and then out onto the main out and back part of the course which also includes a loop around the ESPN Wide World of Sports. 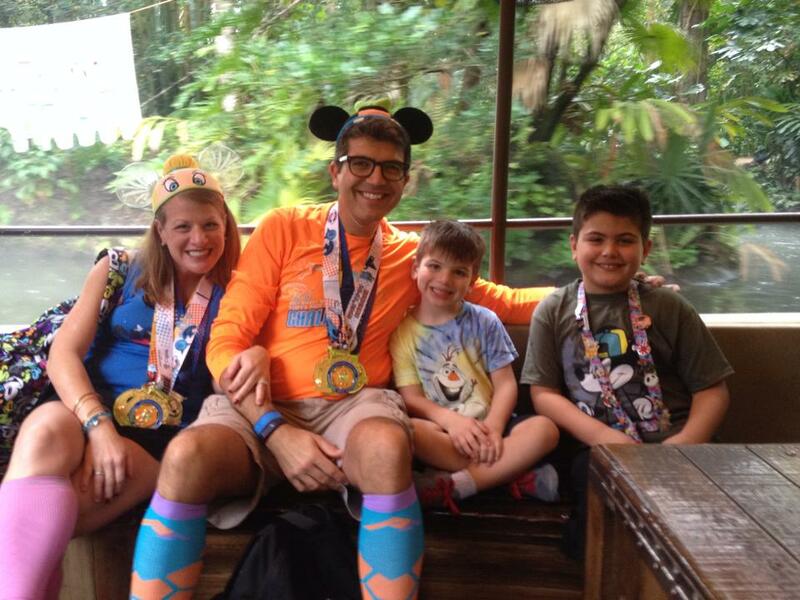 As we were leaving the Animal Kingdom we met another cheering section of Mickey Milers. Despite me not wearing my team shirt today they still recognized me and we stopped so they could take a quick photo of us. The point past the Animal Kingdom to the next stop is a long stretch. It’s from mile 13 to mile 17 where we reach the ESPN Wide World of Sports. Luckily the weather was cool as we were able to pick up time and run a little faster. There is not much to look at between these two stops but runDisney did a good job of trying to keep us entertained with a few character stops and show performers. 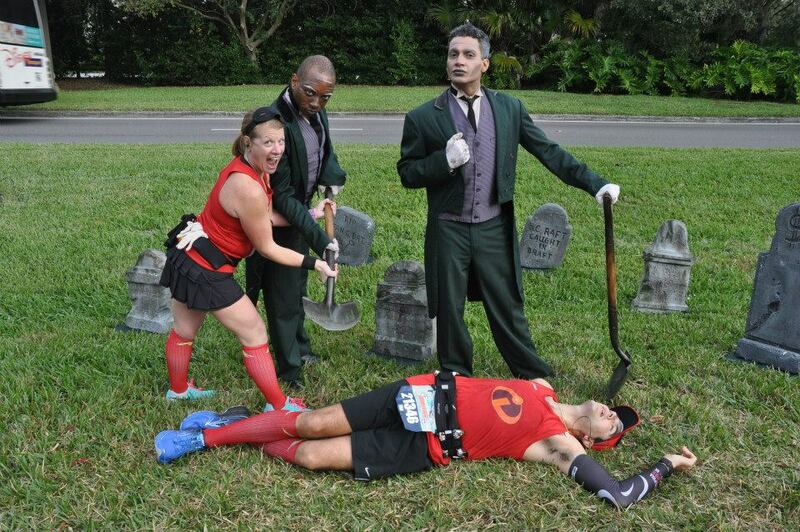 This is always one of the toughest parts of the race and probably the point where my wife was most likely to get irked by my incessant chatting (judging by how she tried to off me with the Haunted Mansion grave diggers). Yes…I think she really meant it. I’m pretty proud of my jump shot here. I totally outdid myself and definitely out jumped the little lady this time. Then again, it may just be the difference in height and the angle of the camera…but I’ll take it!!! I’ll see your jump shot and raise you a bigger jump shot!!! 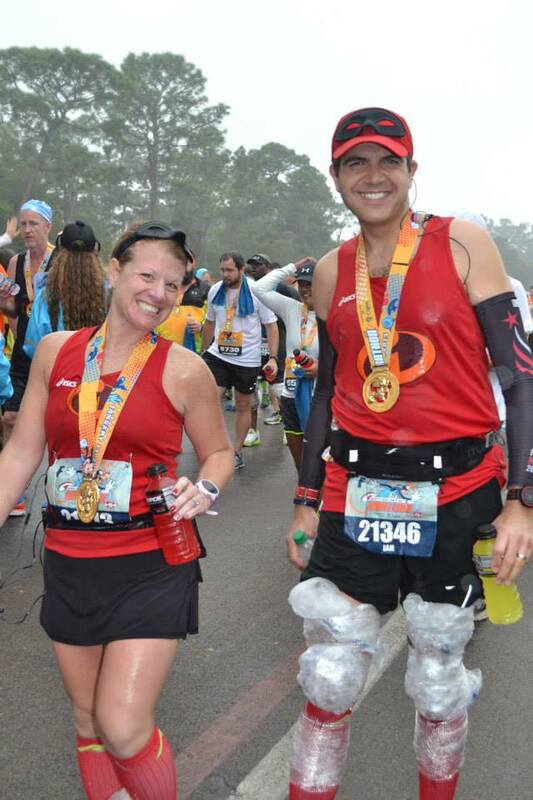 The stretch from mile 17 to 19 (and a bit) is the out and back and run through the ESPN Wide World of Sports. We get to see lots of folks running on our way in and way out of this section of the race. Once you turn into the complex you wind your way around the various pieces of the complex. You run a lap around the track, you run a loop around the football fields and you ultimately get to run through Champions Stadium (spring training home for the Atlanta Braves). It’s pretty cool to see yourself up on the big screen in the stadium as the announcer calls out your name. You run the outside circuit of the track (which was followed by a quick stop to empty the gravel from my shoes). As we were starting our run through the ESPN complex it started to rain lightly and that increased gradually as we ran through the complex. It did however stop as we made our way out. Again we got a chance to see Sarah again. 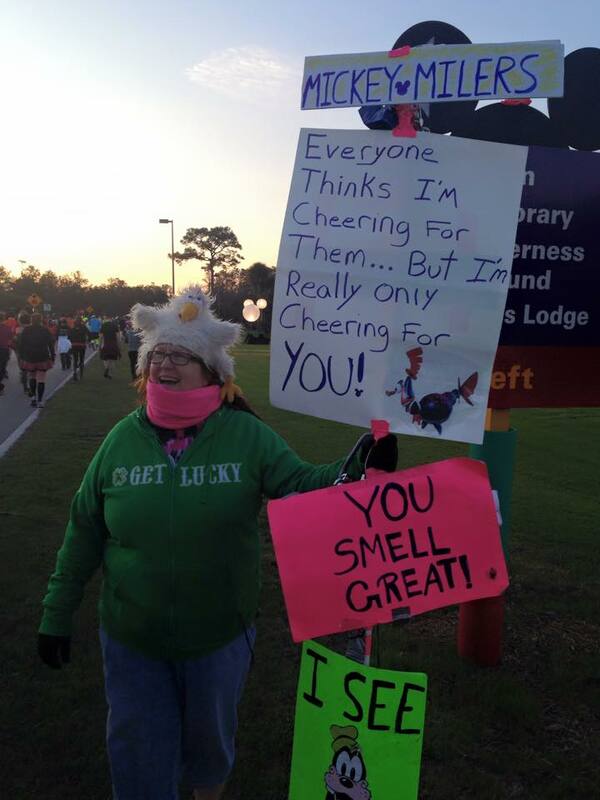 She was all over this course doing a great job cheering her runners. Well planned spectating!!! 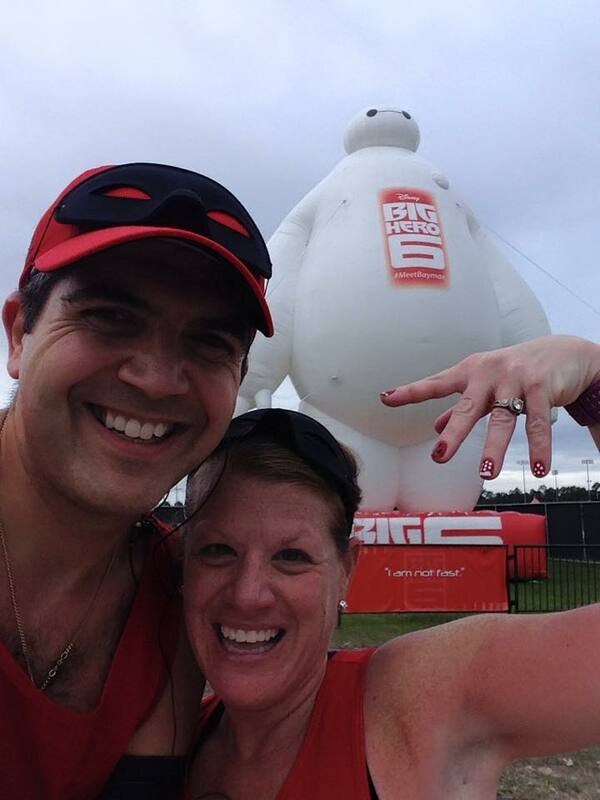 There was a giant inflatable Baymax set up as we entered the ESPN complex. My boys would have loved seeing this. We ran past the medal backgrounds which had been set up for the expo on our way out so we stopped to get a quick medal selfie. As we were leaving the complex we were able to see runners entering. 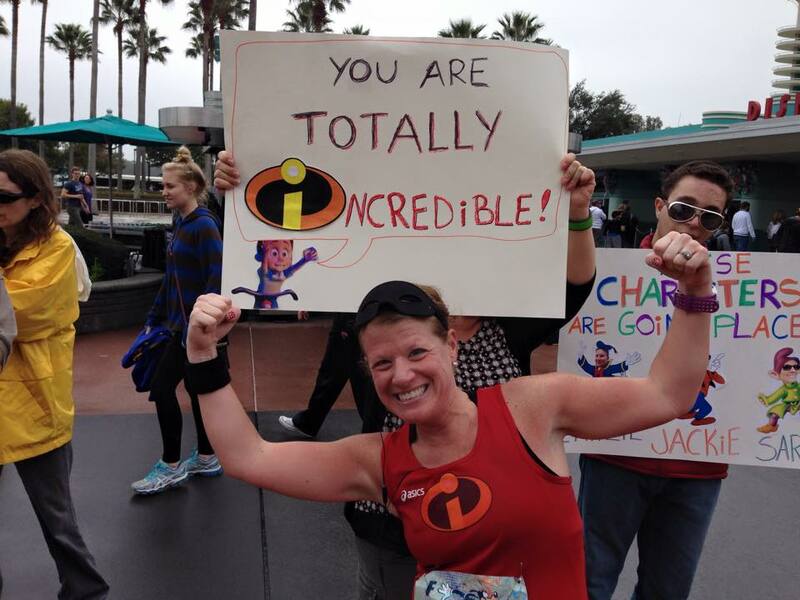 It was great to cheer fellow Team Up runners and Mickey Milers as we passed by them. Also, it gave us a chance to see some great looking costumes. Once you exit the ESPN complex there is a left turn and then you are on your way to Disney’s Hollywood Studios. That is mile 20 through mile 22ish. 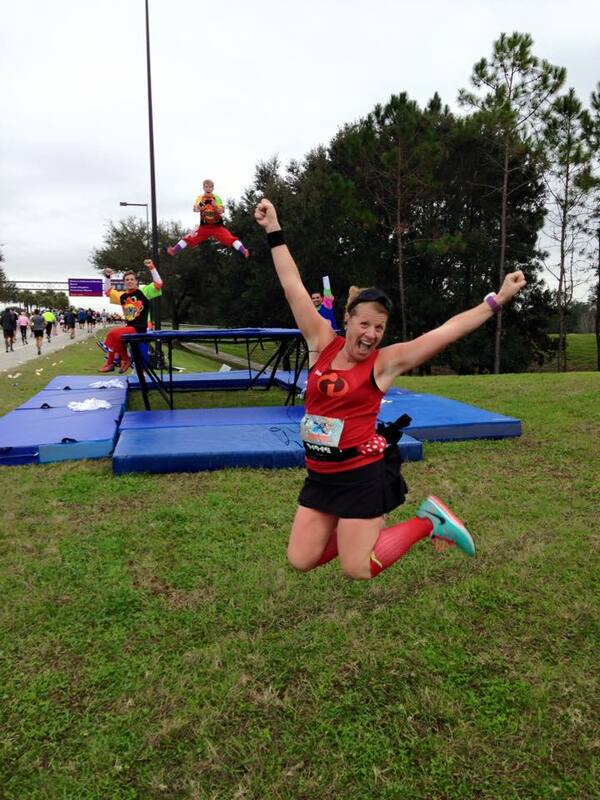 As we were approaching the overpass towards Hollywood Studios we approached another Mickey Miler who was not running the races but came out to cheer on all her teammates. She made sure she was very easy to spot and had a big sign and goodies for all her teammates. Nice job Laura. 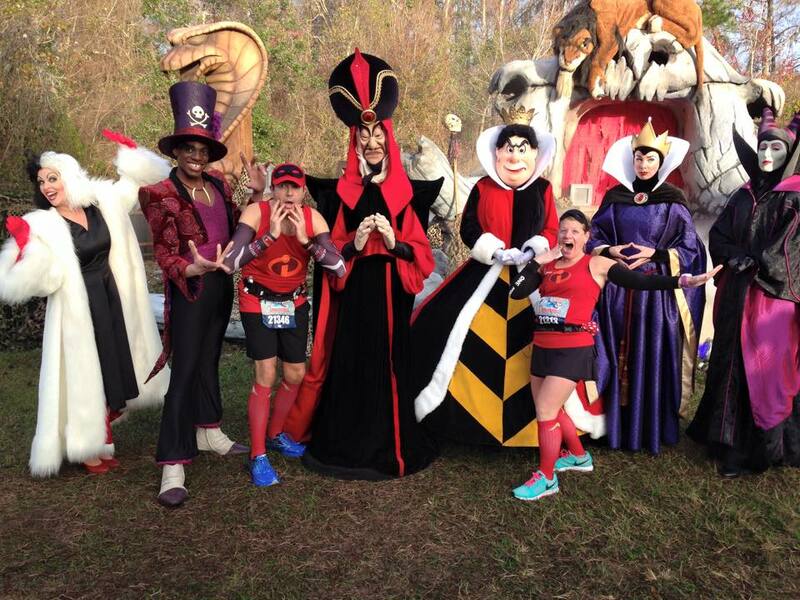 This is how you get runners to find you during a race. Awesome spectating Laura. After a quick hello and goodbye to Laura we ran on towards Hollywood Studios. As we were working our way up the hill under encouragement from the Green Army Sergeant we stopped and I was forced (again this year) to do push ups. At this point I noticed that this was the second time in the last few miles that I was the only one of the two of us who seemed to have to get down and dirty (following my escape earlier from the graveyard). Something was wrong with this. Never mind…I’m sure my wife loves me. As we entered Hollywood Studios it starting raining lightly again. BUT THEY HAD CHOCOLATE!!! Yes, as you enter the park backstage they were handing out Hershey miniatures. Shari took ‘a few’ as we passed. I’m saying no more. Anyway, we were on a mission. 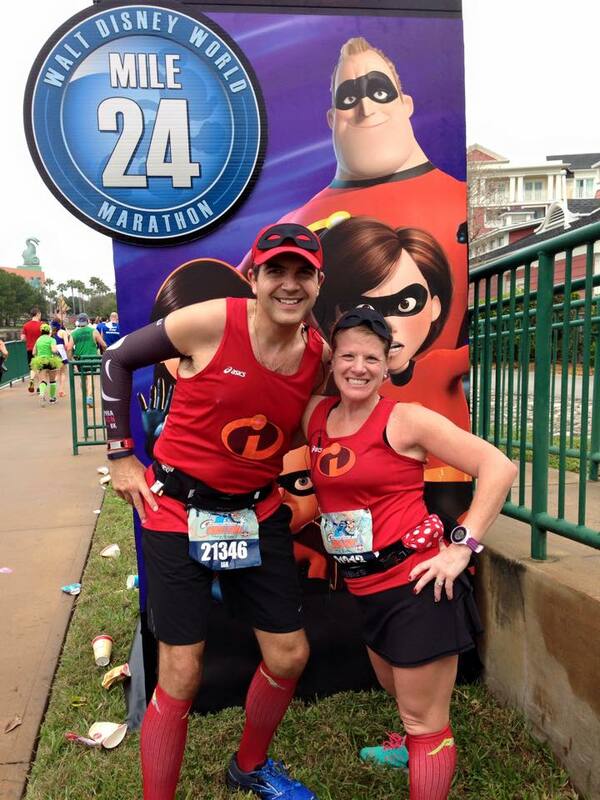 We had to find Mr and Mrs Incredible. This was the one character stop we knew we were going to stop for regardless of time. We passed the point of the park where we remembered them being in years past and were a little disappointed until we turned a corner and there they were….both of them. We had only seen either one or the other in prior years. There it is…the money shot! AWESOME!!! Totally energized us for the last 3 miles. We had a quick stop with Mike and Sully from Monster’s Inc. and then took what would be our last run past the Sorcerer’s Hat (which by the time you read this will probably be gone). One of us can only see out of one eye. The other is Mike Wazowski. The park was open for guests as we ran through and it was amazing the cheers and support from the guests who were watching us pass by. 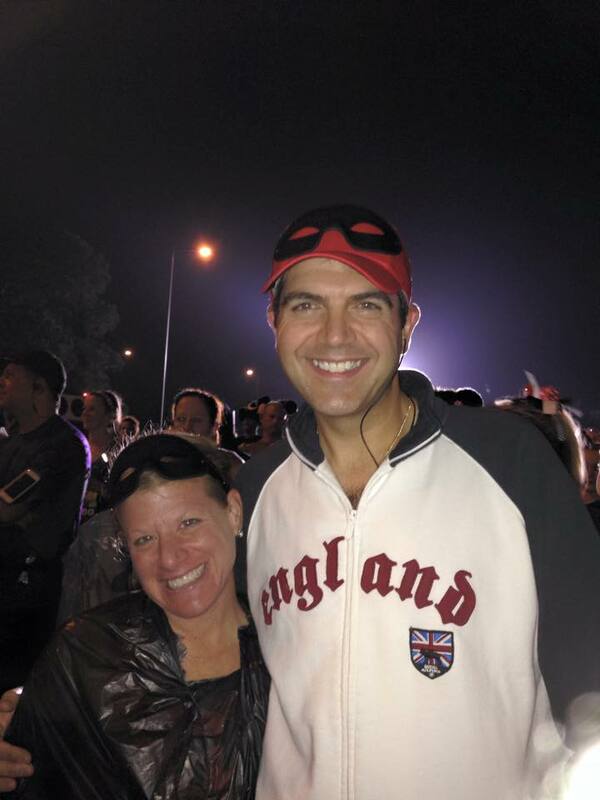 We got a few shout outs for our costumes. I will admit we may have hammed it up for them. Just a teensy bit. Upon exciting the park I felt someone tap on my shoulder and I quickly apologized to that person thinking I had either cut them off or knocked them in some way with realizing (the one eye thing is my excuse here). We saw an appropriate spectator’s sign and I was able to get a quick photo of Shari with the sign. Suddenly I felt a tap on my shoulder again. What? Why? I turned around and there was a runner standing there trying to get something out of his pocket. He wasn’t talking and then suddenly he pulled out a plastic bag with a bingo card inside. 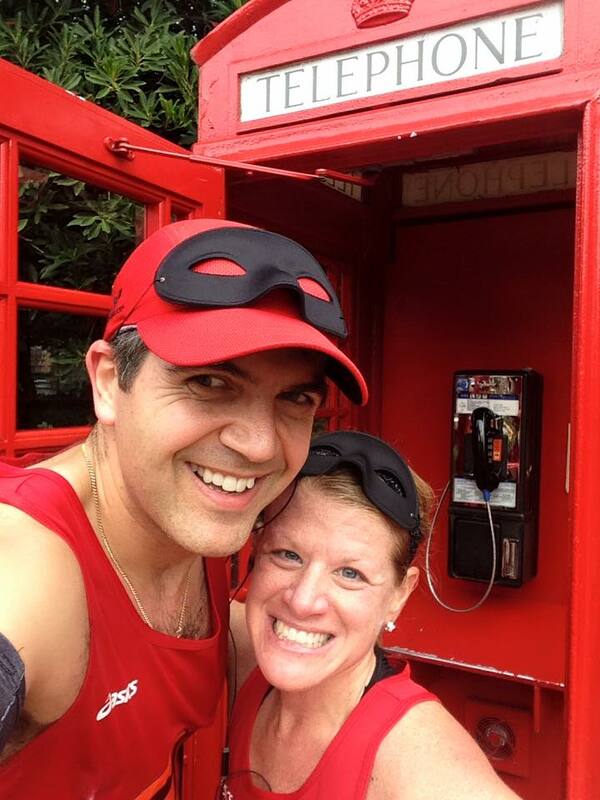 He said he was playing ‘Marathon Bingo’ and he had a square which told him he needed to get a selfie with people dressed as Mr and Mrs Incredible. Wow!! We made it to the bingo card. We cracked up but let him have his photo. Hey, we may have run almost 39.3 miles but that doesn’t compare with being a winning square on the marathon bingo card (LOL). That (together with the amount of sugar Shari had ingested) made us laugh as we headed out towards the Boardwalk. 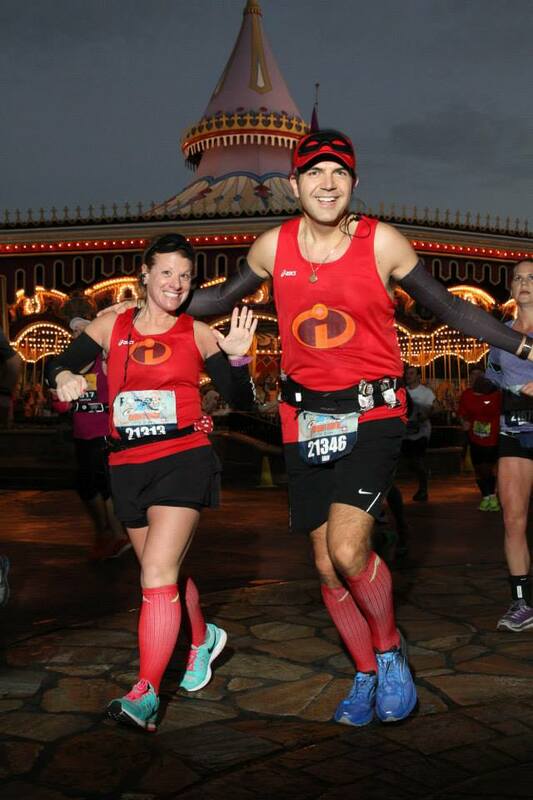 As we ran along the path to the Boardwalk we were giving high fives to the little kids who had come out to spectate and everyone was cheering on the ‘Incredibles’. It was lots of fun. 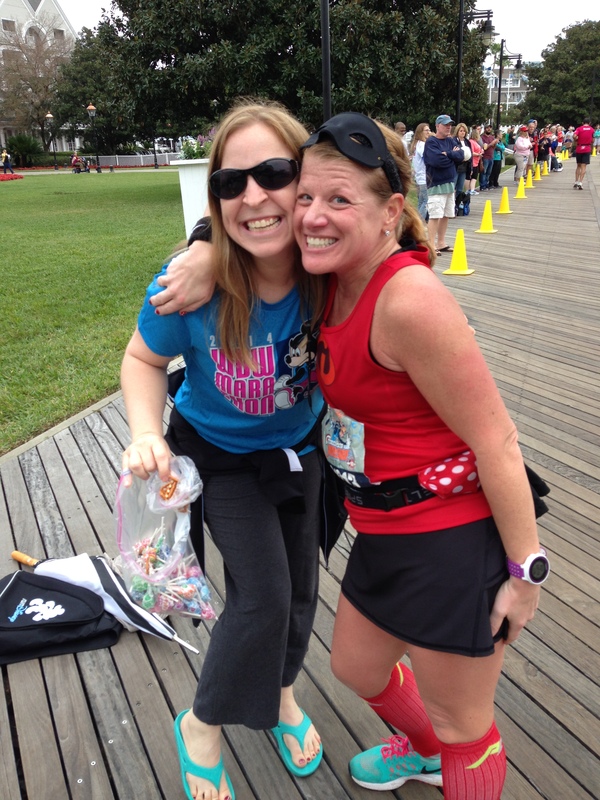 Upon reaching the Boardwalk, Shari knew that her friend from college might be out supporting runners and started to keep a look out (this was between taking Twizzlers and Oreo cookies from generous spectators). Eventually as we approached the Yacht Club Shari saw her friend Cori and stopped for a quick sweaty hug and a photo. 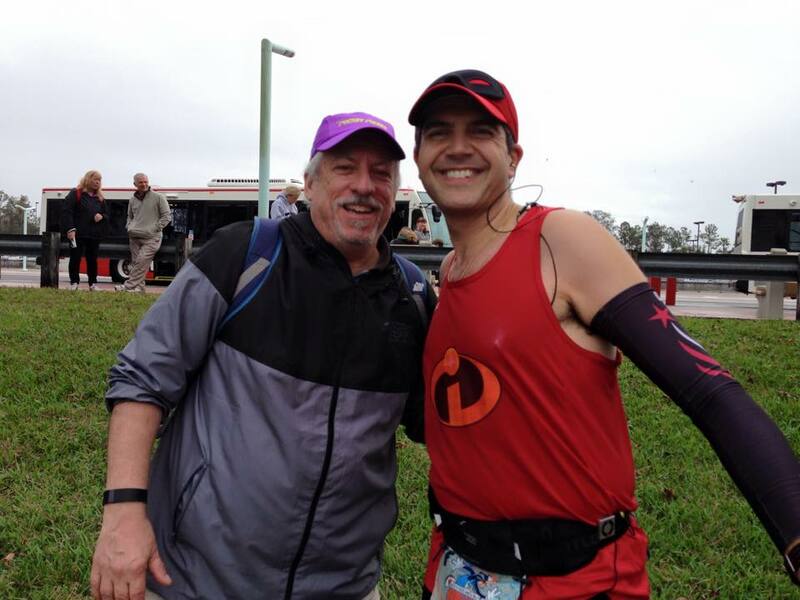 As we moved around the Boardwalk to the path alongside the water way behind EPCOT we bumped into Mickey Milers Team Captain Mike Scopa (check out the Mickey Miles Podcast and WDW Today to find out who Mike is) and we stopped for a quick hello. 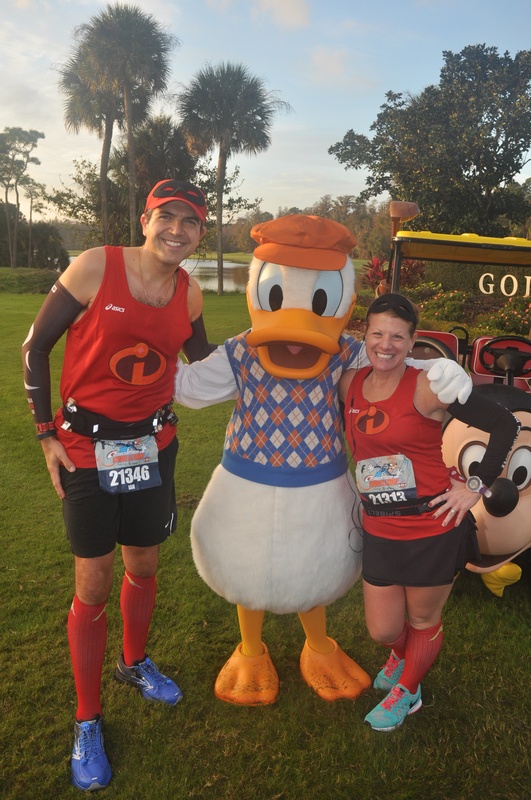 He was out to cheer on fellow Team Captain Michelle and all the rest of the Mickey Milers still out on the course. It’s such a great team. We were almost at EPCOT, the home stretch. We enter EPCOT through the International Gateway which is located between the Canada Pavilion and the United Kingdom Pavilion. 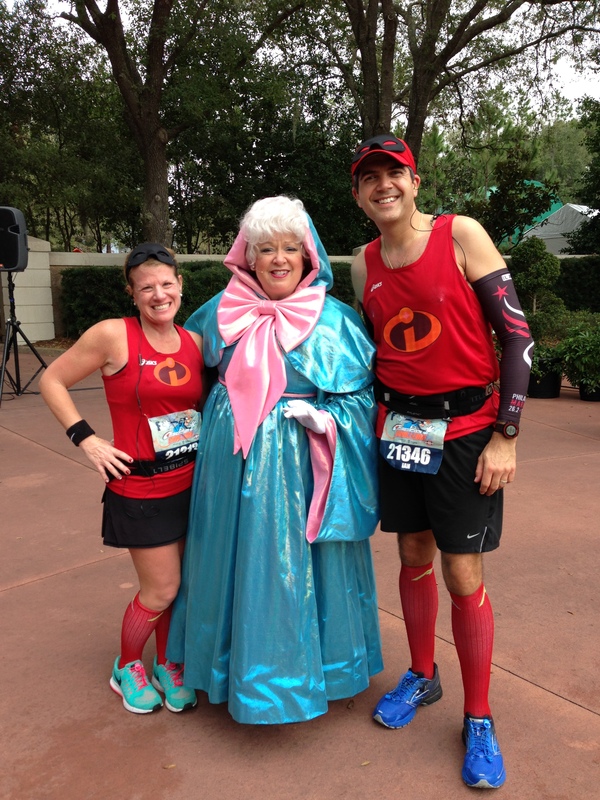 Just before the entrance we got to have a little moment with the Fairy Godmother. 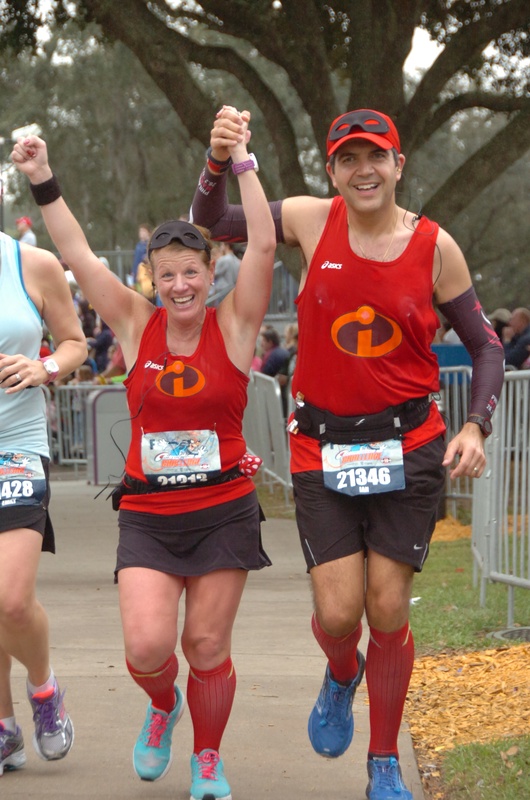 I think her magic was working as Shari and I were feeling good…although Shari had so much sugar in her system from all the snacks she was like a little Energizer Bunny (more so than usual) even at mile 25!! 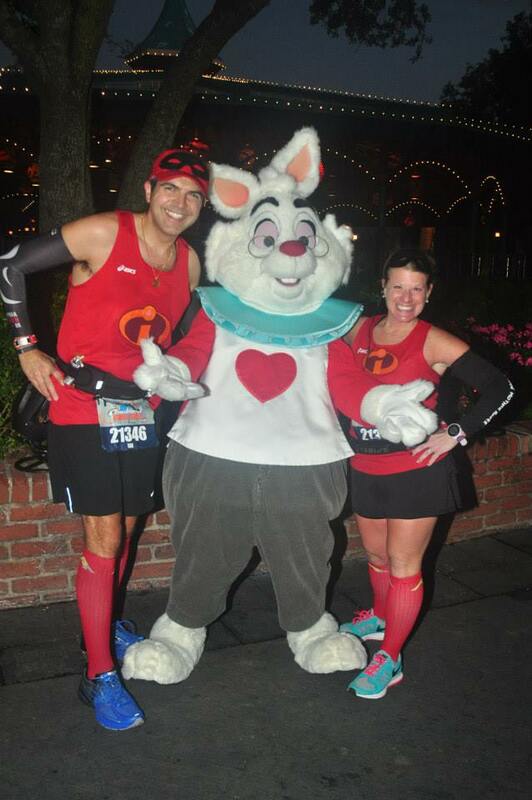 We made sure to get some character stops in as we were doing fine for time with only a mile to go. 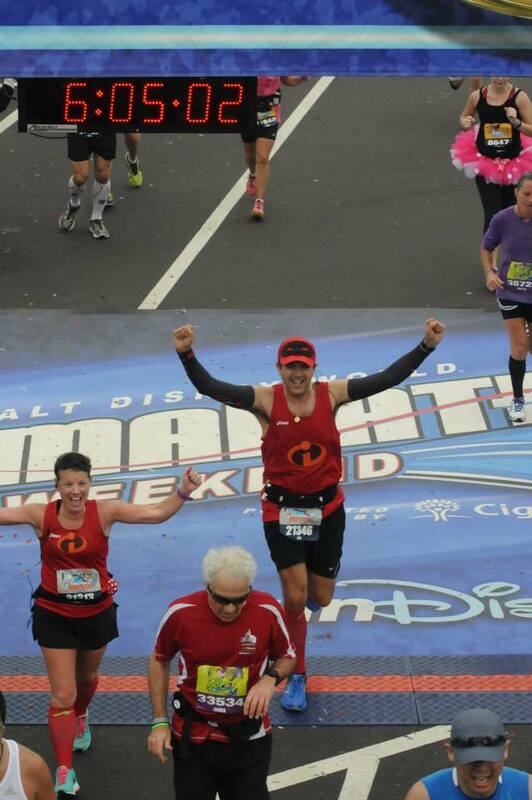 This wasn’t going to be our fastest marathon by any means but it was definitely one of the most enjoyable ones. Soon we were exciting World Showcase and heading towards the finish line. The rain was steadily increasing but then again so was the crowd support. It was awesome. Once you are by Spaceship Earth you know the end is close. We rounded the corner of the Future World attractions and headed out towards the parking lot, past the choir and down the home straight with the finish line in sight. We could see the finish line just ahead. We look a little happy. 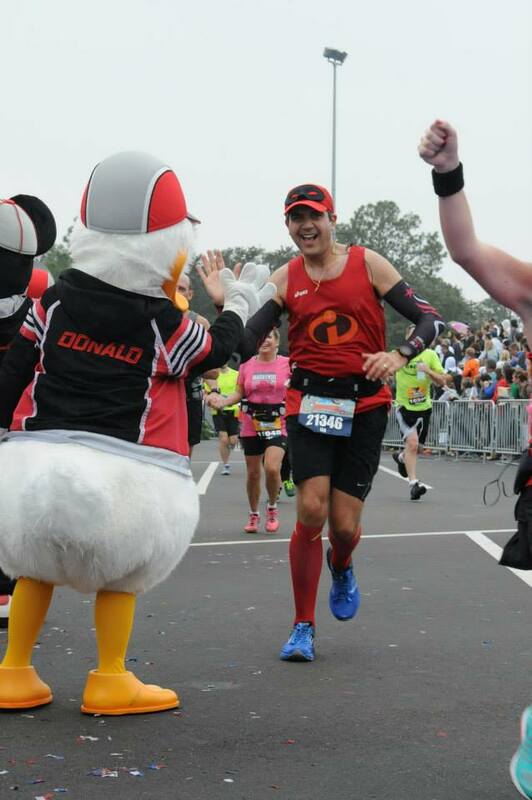 We were greeted by Mickey and the gang at the finish line. We did it. We had run 39.3 miles and raised over $4,300 for Autism Speaks. 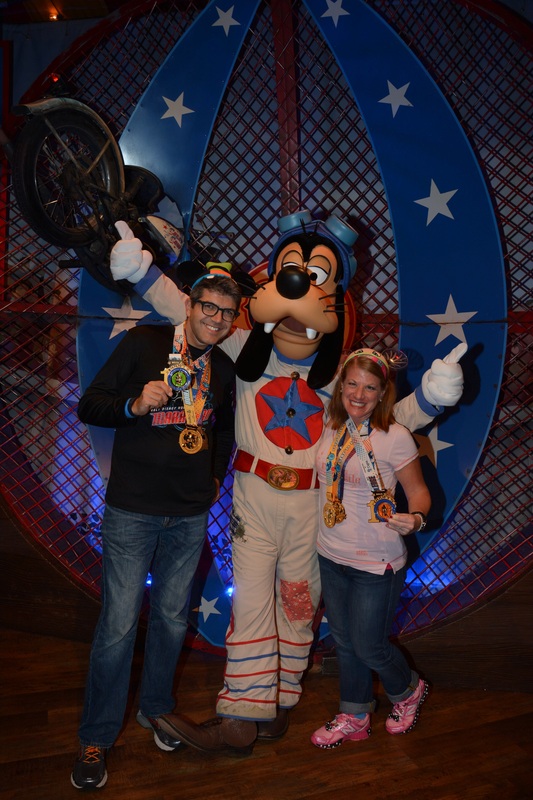 We were both Goofy! 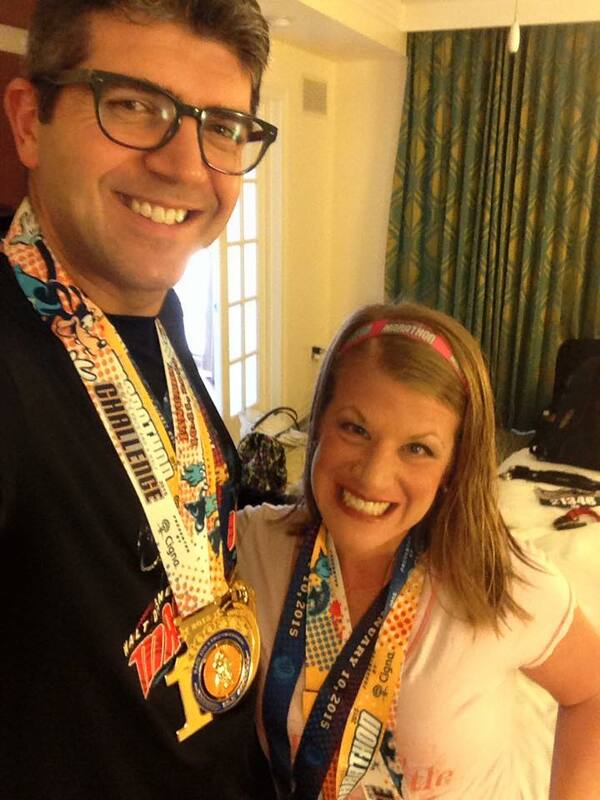 We both felt great and headed over to get the marathon medals. 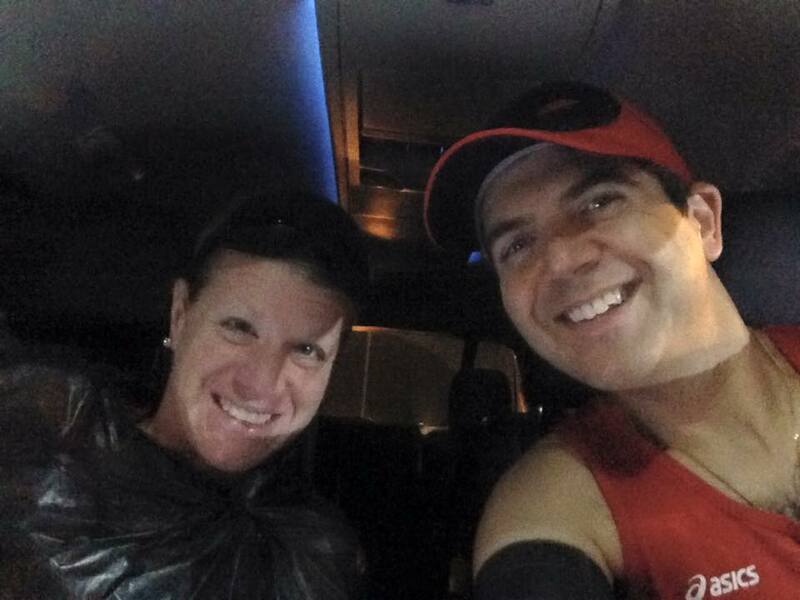 From there we went over to the medical treatment area to get some ice packs to help with the post race recovery. The rain started to come down harder (probably the worst rain of the day at this point) and we sat shivering as ice was being applied to our knees, ankles, quads, etc. What was missing? Mylar blankets. What??? 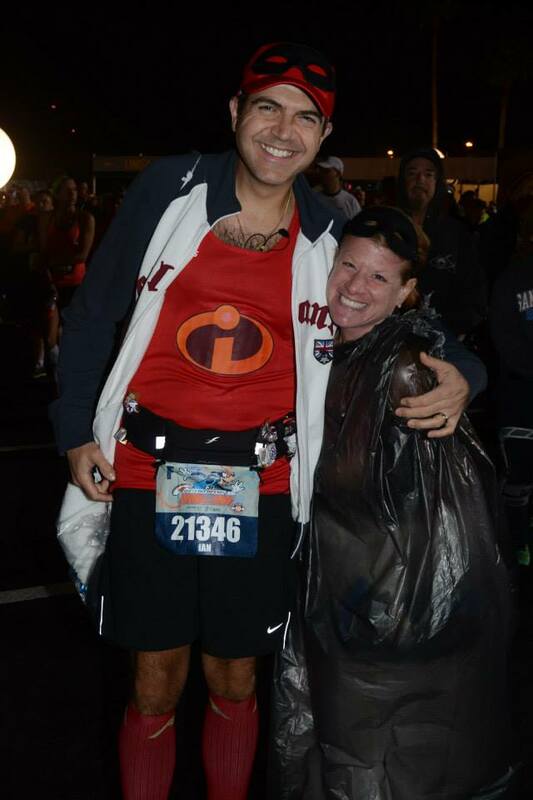 All weekend had been on the cool side and I did not see any mylar wraps being provided to runners. 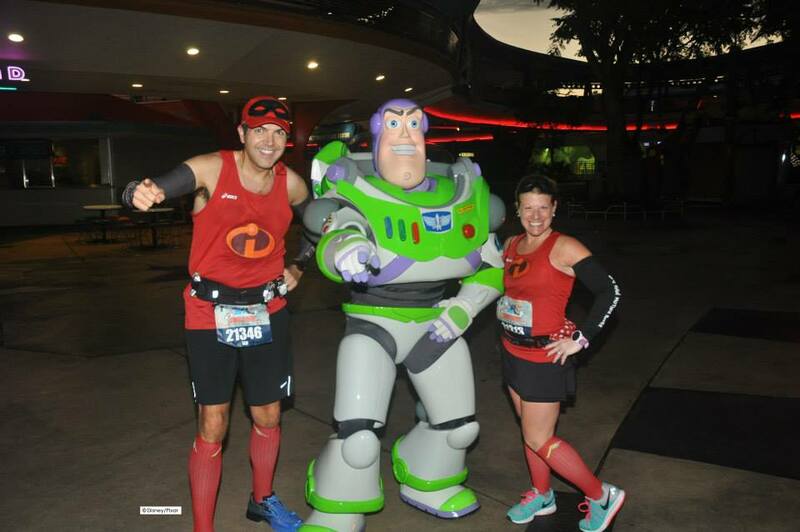 If that was my biggest complaint over the last two days it was not a big deal but really, come on runDisney, you could have provided wraps for the runners. Especially as the weather had been so cool for the first few days of the event you would have thought they would have been prepared for the marathon. We were shivering by this stage so rather than sit for 10-15 minutes as would be the norm for us we just decided to get up, grab our drinks and food and go through to get our Goofy medals. Brrr. Ironically, they were handing out cooling towels as we left the medical area!!! I pull off the ice walk pretty good. Interestingly as we headed through the Goofy chute they had volunteers with laptops open and they were checking our bib numbers and looking us up to match our sweaty tired faces to the fresh happy faces that they took a picture of a couple of days earlier at the expo. From there we went through the tent and into the photo areas for the official race photos. As we were still wrapped up with ice (well mainly me) because we had left the medical area so quickly I said to Shari that it would probably not make such a great picture. She told me no-one would notice. Oh really??? A little ice with your picture Sir? When you have a short wife it is very difficult to crop the picture and not show the amount of ice attached to your legs. 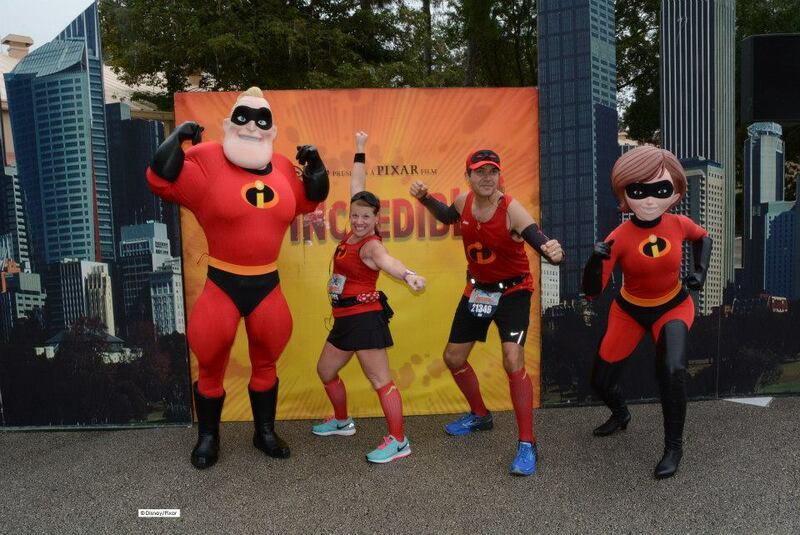 My excuse is that I was channeling both Mr Incredible and Frozone in the same costume (yeah…right). 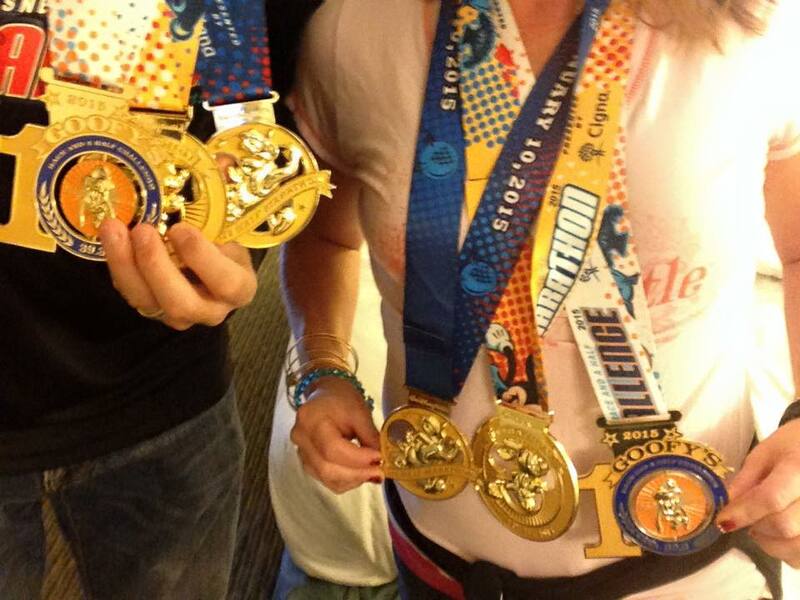 Here we are with both the Marathon and Goofy Challenge medals. 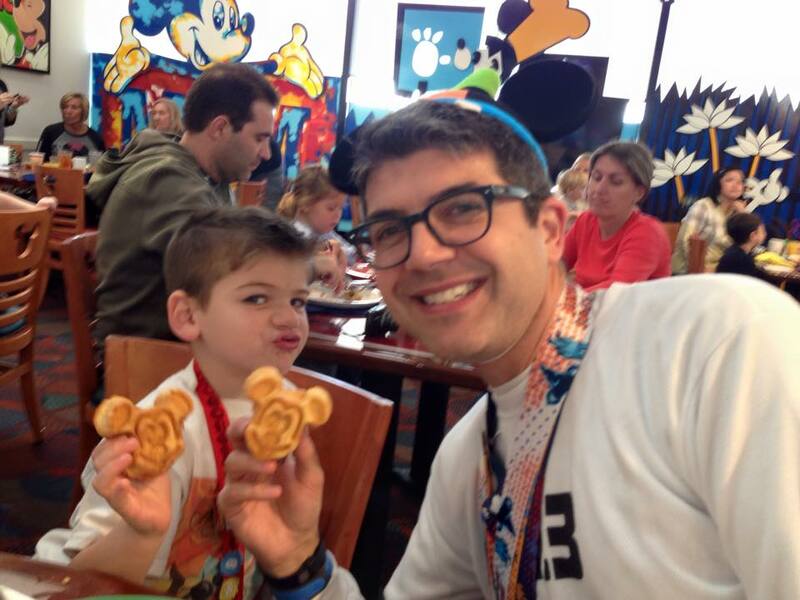 We headed home for hot showers and quickly got ready to head over to the Magic Kingdom. We had Fast Passes for Peter Pan and I needed my Mickey Bar ASAP! All refreshed and ready to head to the parks. 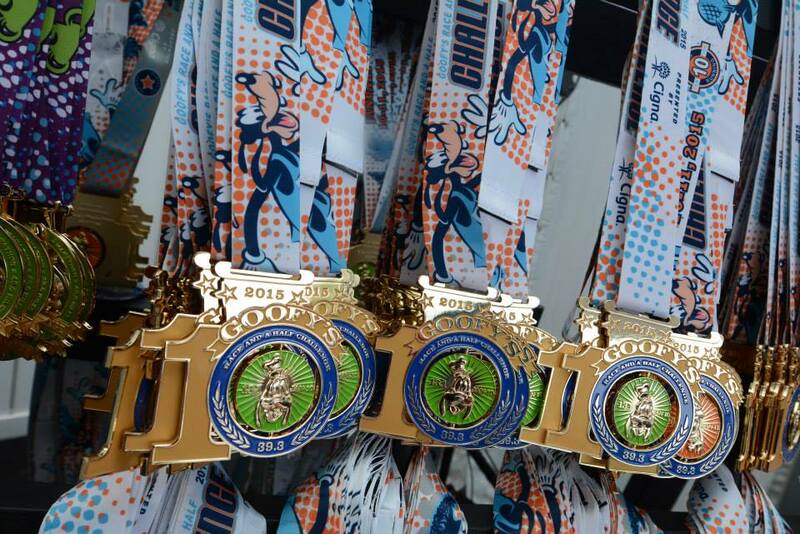 Ready to show off our bling. We returned to the Ticket and Transportation Center (we didn’t run there this time). As we got on the tram from the parking lot to the TTC I was sitting up front with the stroller and people started noticing my medals and asking what they were. 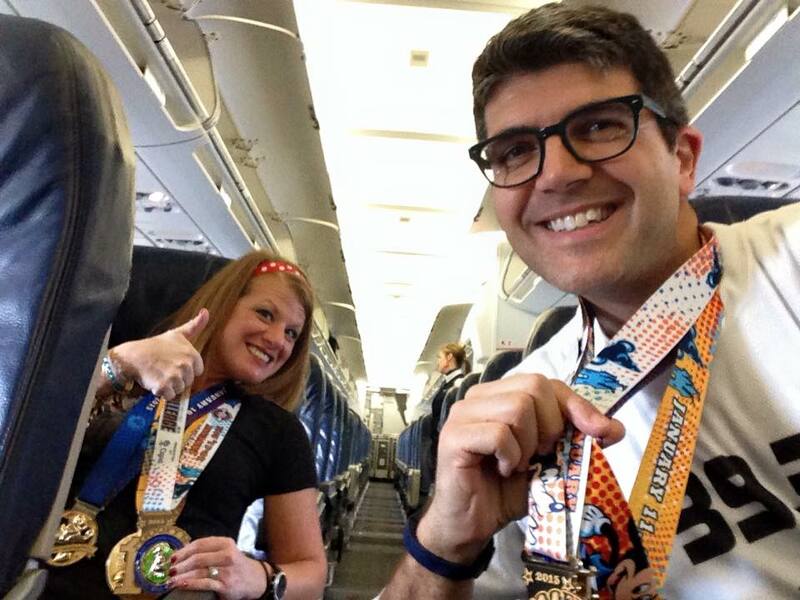 I told them that my wife and I had just run the marathon and that were other races over the last few days too. They were intrigued. One fellow asked how I did in the marathon. My response? “I medaled in the race”. That got a laugh from people who got the joke. I’m not sure he did though LOL. As we walked up to the monorail I saw Jennifer (The FInal Forty) and her boyfriend Todd also getting on the monorail to the Magic Kingdom. They were still in costume as Ariel and Prince Eric and must have come straight from the finish line. Ha ha. We spent the rest of the day wandering around the park to keep our legs moving and wishing everyone wearing a medal congratulations. We hit up our Fast Passes (which included the ‘Enchanted Tales with Belle’ and the ‘Seven Dwarfs Mine Train’ which was excellent) and generally relaxed. Despite running all that distance we didn’t really do a big meal. 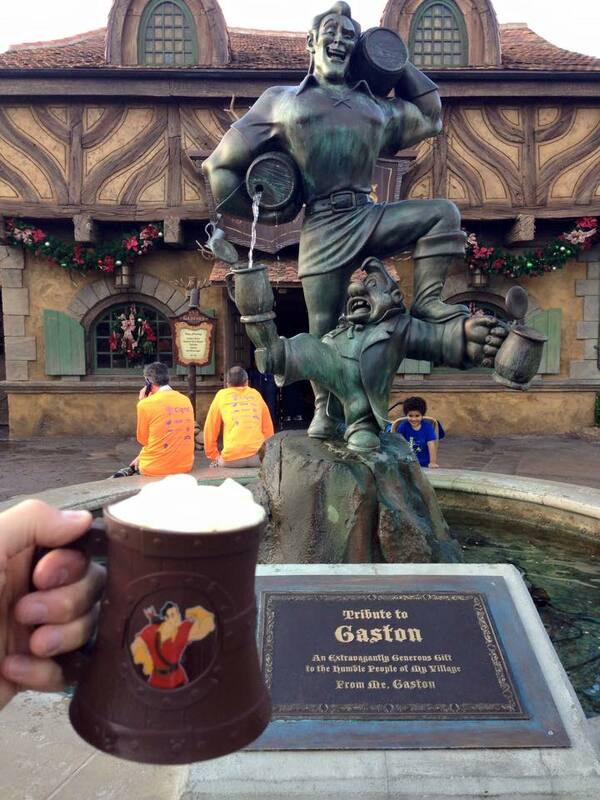 I got myself a cup of Lefoux’s Brew at Gaston’s Tavern and then after the character photos at Pete’s Silly Sideshow we all sat on a wall and ate Mickey pretzels and Mickey ice cream bars. Perfect. We ended the day with me hiding my 4-year-old from the fireworks while everyone else saw them. Oh well. There was always Plan B tomorrow when I would get to see the fireworks. At least I got a nice shot of the Castle as we were leaving. On Monday we were up bright an early. 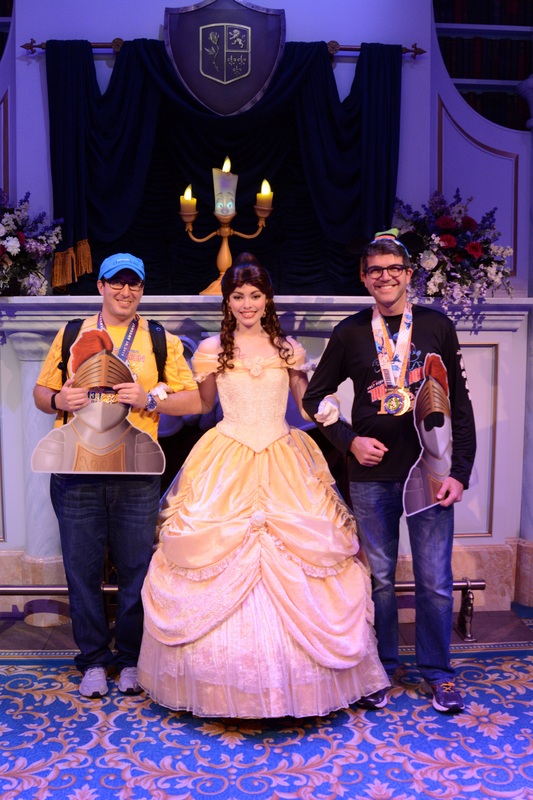 Some idiot (ahem) booked an early morning character dine at the Crystal Palace inside the Magic Kingdom which meant we had to get up and out really early. I will admit that getting up at 6am is much easier than getting up at 2am. Not everyone else was that enthusiastic though. Today would be very much a celebration of our weekend for both my wife and I and also for my sister-in-law and brother-in-law. We had been rushing around so much since before we headed down to Orlando and we hadn’t really had a full day at any of the parks yet. We entered the Magic Kingdom before rope drop and took advantage of the absence of people along Main Street USA to take some professional photos before our breakfast reservation. At breakfast we bumped into our runner friend from the marathon and had a chat about how much fun the day before had been for us all. It was great as we got a chance to relax and refuel. I also had pre-ordered a gift bag with treats as a special reward for my wife. 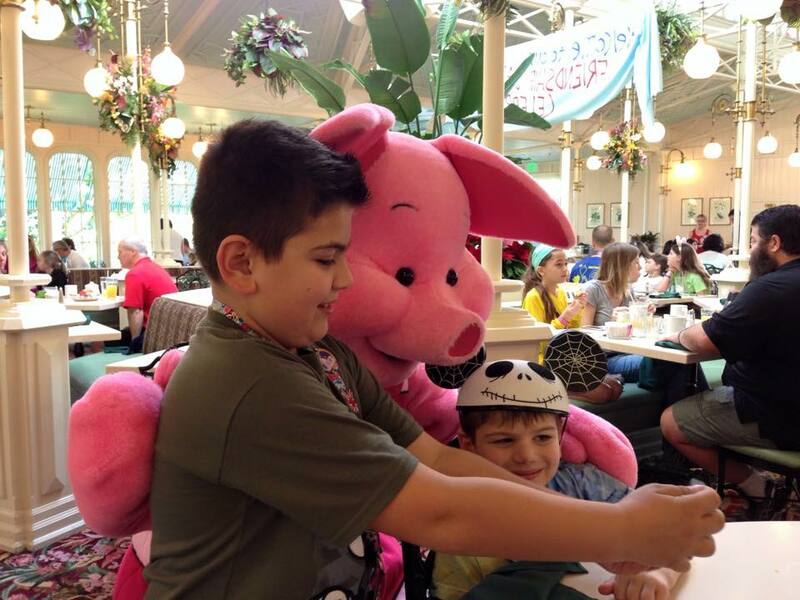 She had done similar for me when I arrived at the Magic Kingdom last year. One of the best things about this week was meeting and catching up with friends old and new. Today was no different. While walking through Adventureland I again bumped into Sarah, Matthew and her Dad. 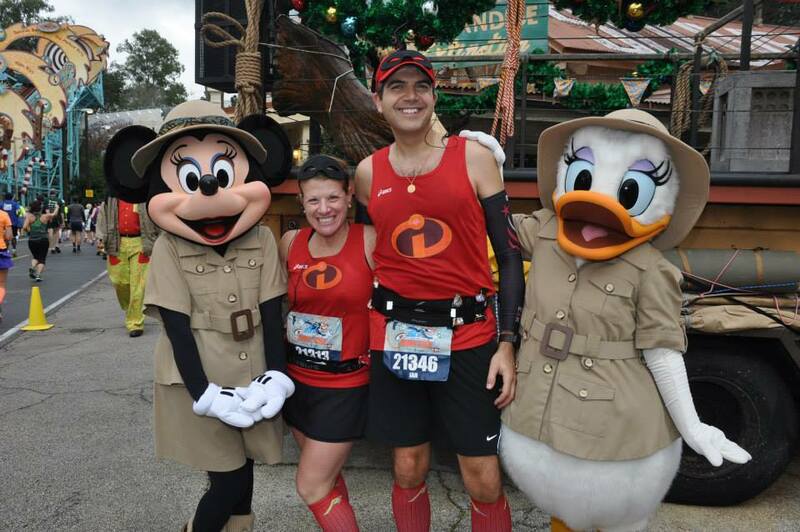 I was congratulating them on a job well done when my Mickey Miler teammate Jennifer saw me and came over. She had been looking to meet up with me to give me a little gift that she had brought with her all the way from California. 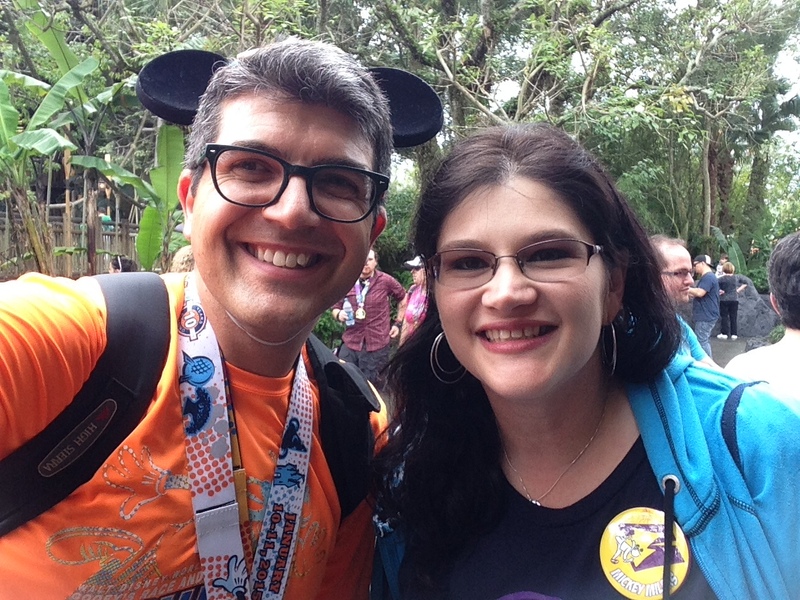 I also bumped into Chris (@DopeyRunr) and Laura from the Mickey Milers while in line for Pirates of the Caribbean. I was loving meeting up with everyone. It was such a great experience. 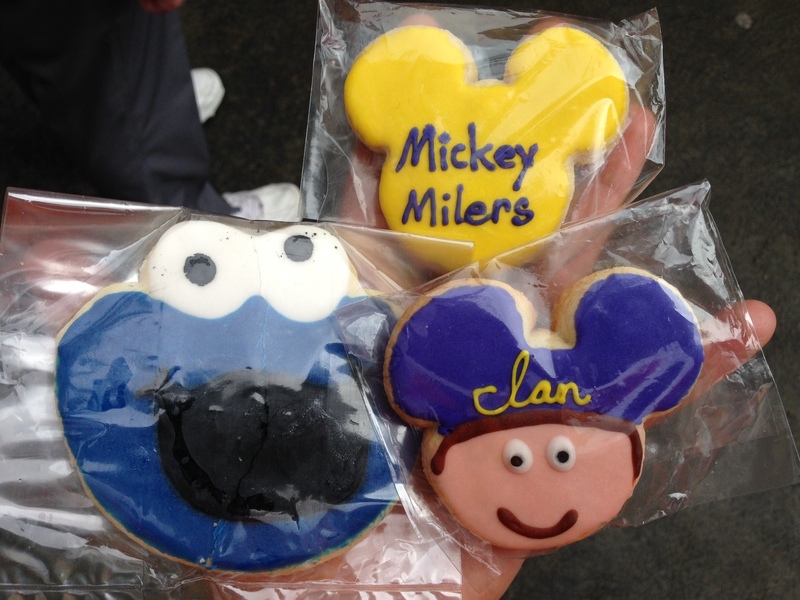 While we were on the Jungle Cruise that afternoon we got on board with another couple of Mickey Milers, David and Darren. Both had run their first marathon the day before so it was great to congratulate them in person. David took this photo of my family while we enjoyed the cruise. Pretty much after we finished the Jungle Cruise the heavens opened and it poured for most of the rest of the day. 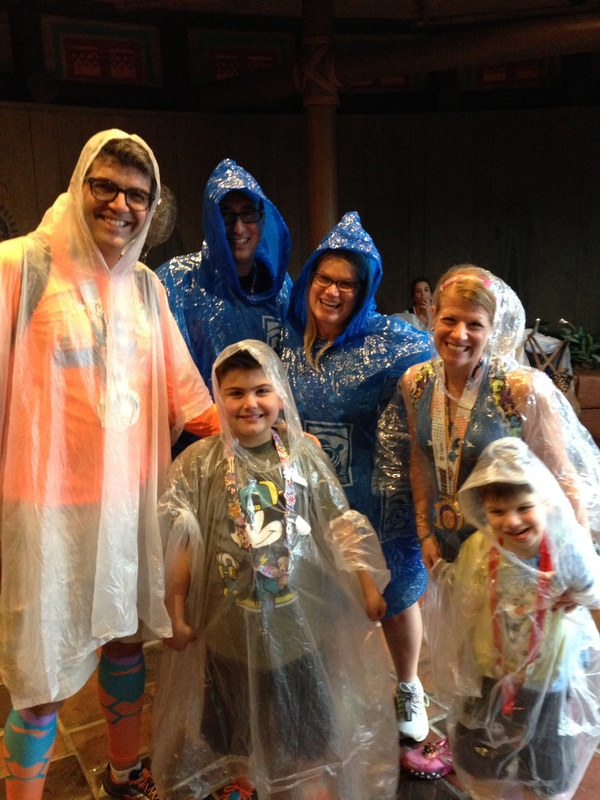 We were prepared with our ponchos but either way were we a little damp but this did not dampen our experience. The park actually cleared out which surprised me. I thought that any indoor rides would be crowded but people seemed to have just left and we found ourselves able to ride and re-ride certain attractions with little to no wait. That was great. Although we missed the Festival of Fantasy Parade because of the weather (it was cancelled) we stuck it out long enough to see the evening Castle show and fireworks. Tonight we decided to let Asher wear a pair of headphones and play on the iPod and he completely was unphased by the fireworks. Genius!!! 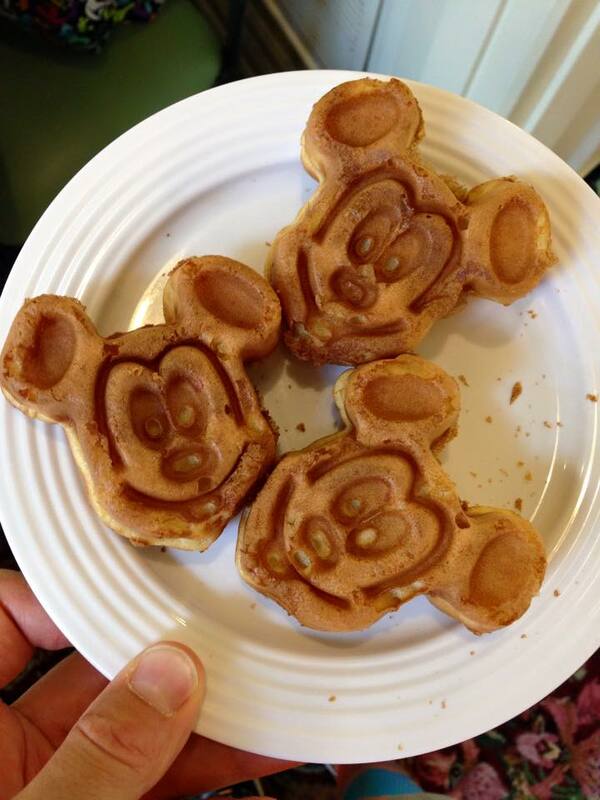 It only took 3 visits to Walt Disney World to figure that one out. 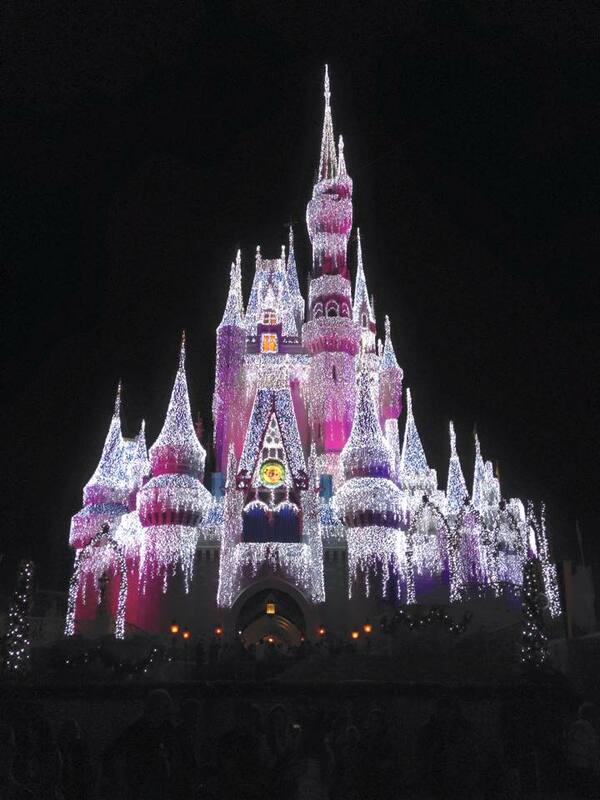 We stayed until they pretty much kicked us out the Magic Kingdom. What an awesome day it was. We enjoyed every second and made the most of our day in the park. We actually only just made the last monorail out of the park. The rain had stopped and the park had emptied and I managed to get one last photo in before we left. 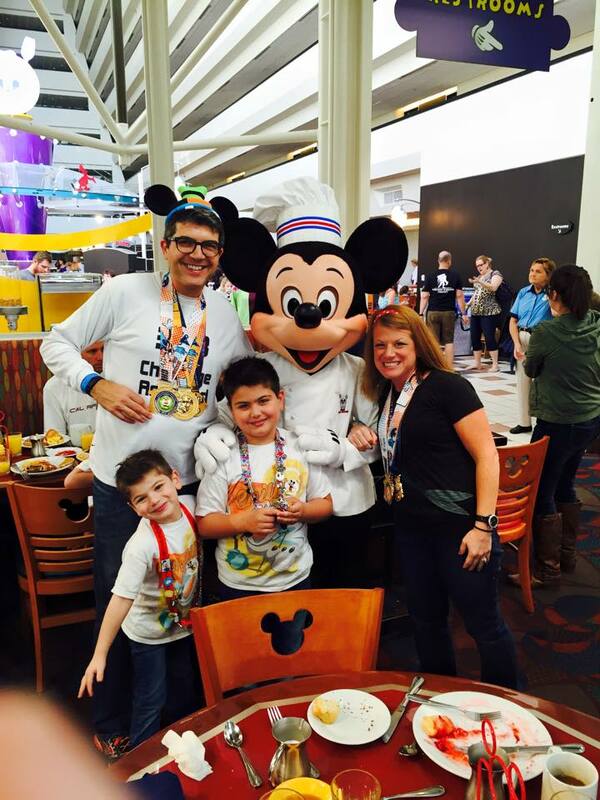 On Tuesday we did our usual last day breakfast with Chef Mickey at the Contemporary Resort before making our way back home. On the way out of breakfast I bumped into Jennifer and Todd once again. It was such a fun weekend that I knew I was going to miss seeing everyone once we left. I have so many good memories with family and friends from the weekend. 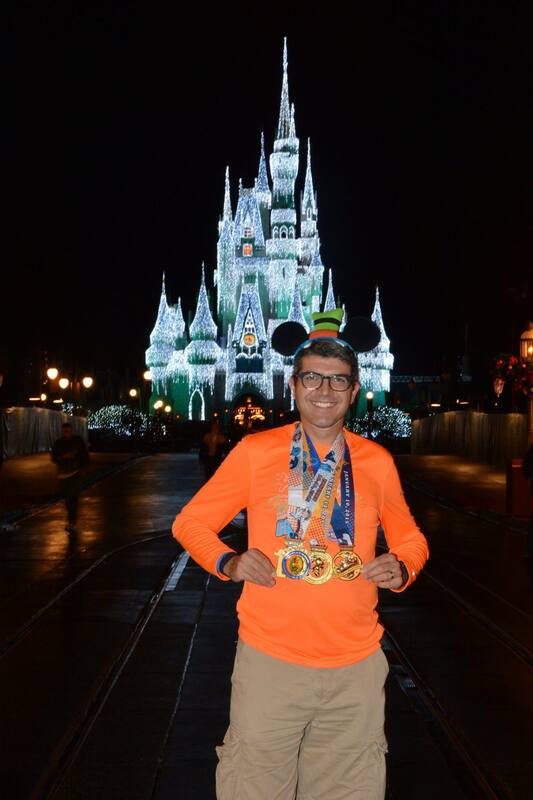 It was great to feel such camaraderie and be part of a team like the Mickey Milers. We were truly all looking out for each other. Amazing. 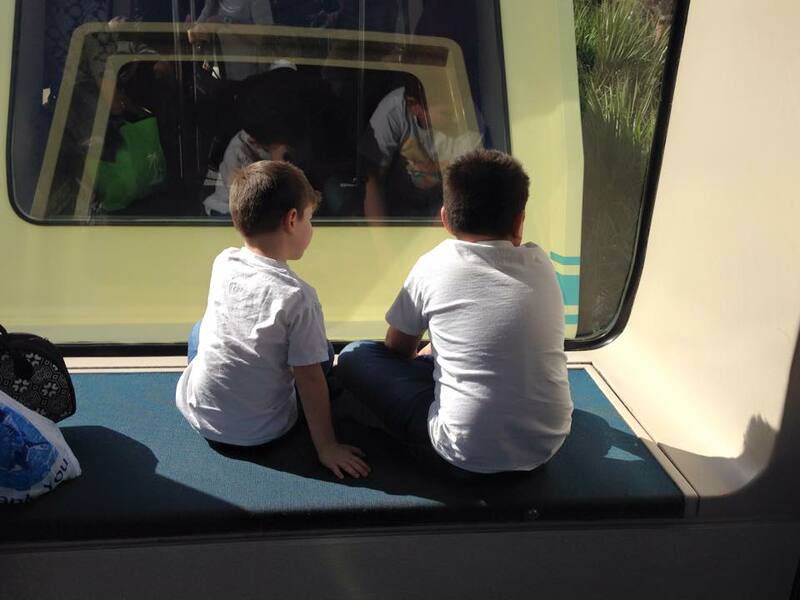 All that was left was the saddest monorail trip…the one at the airport and then the flight home. 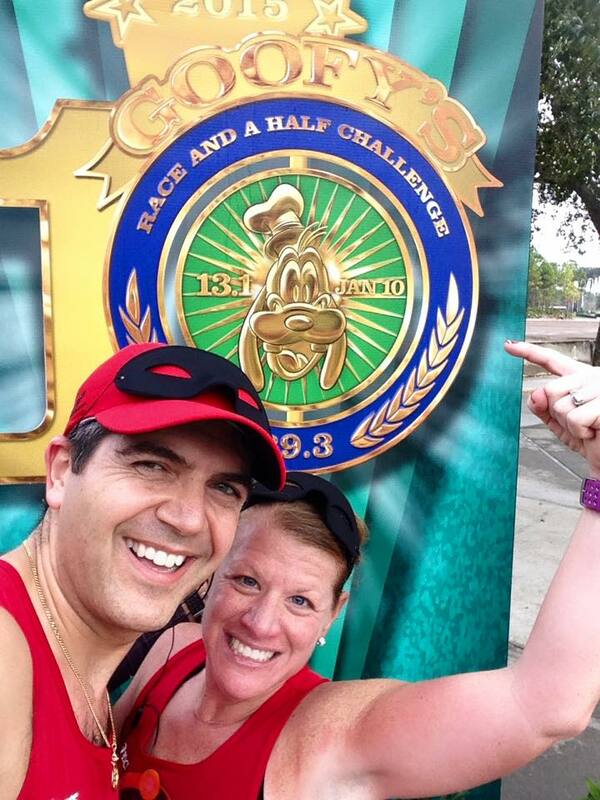 I know this was a very long post (it stretched over an extra couple of days) but I wanted to express how much fun the marathon (Goofy Challenge) was for Shari and I. 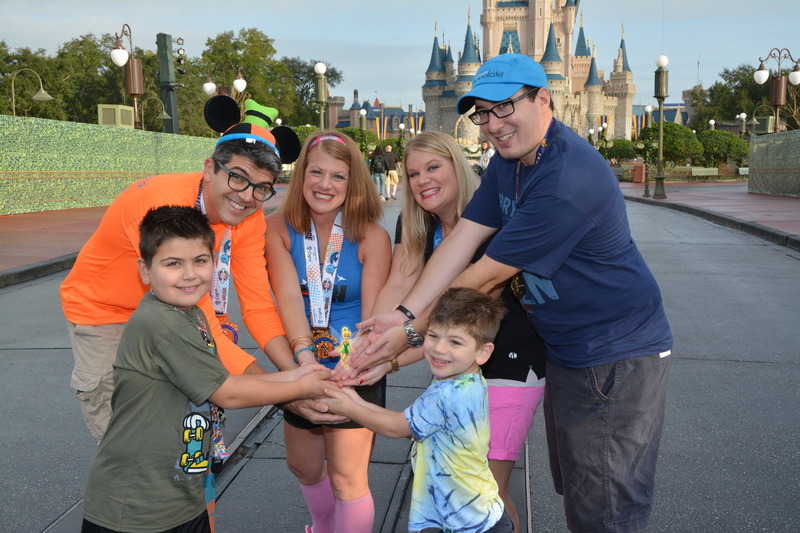 How much fun we had meeting friends along the way and making new ones, raising beyond our goal for the charity and ultimately enjoying the parks with our family. I appreciate all the kind words of support and donations you have provided on this journey and look forward to many more events such as this in the years to come. Hopefully I’ll see some of you along the way.